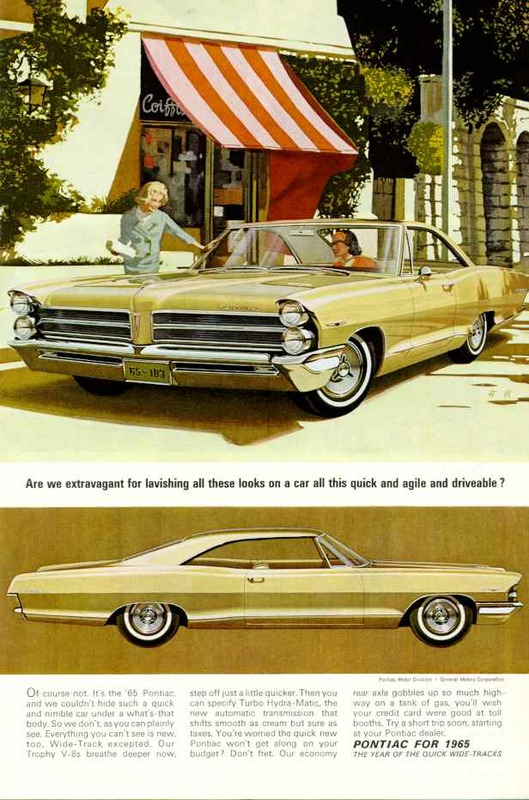 In the dawn of the mid sixties there was a change in the “fashion” of American motor cars. 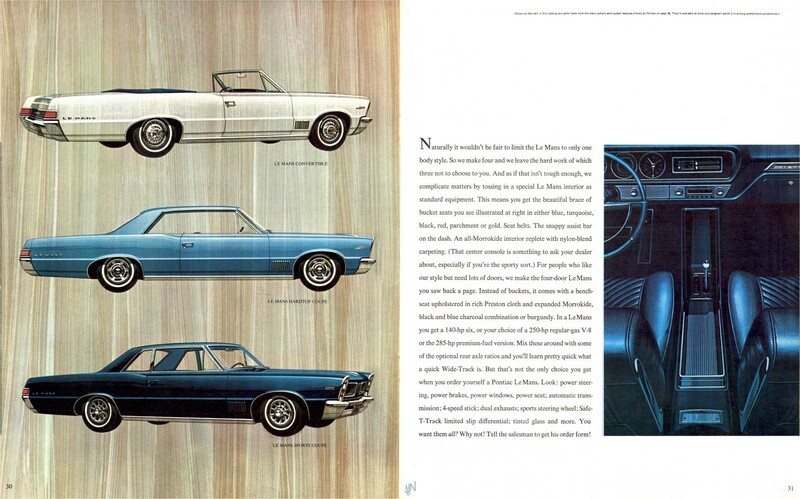 The new kid on the block was the ”Muscle car” . 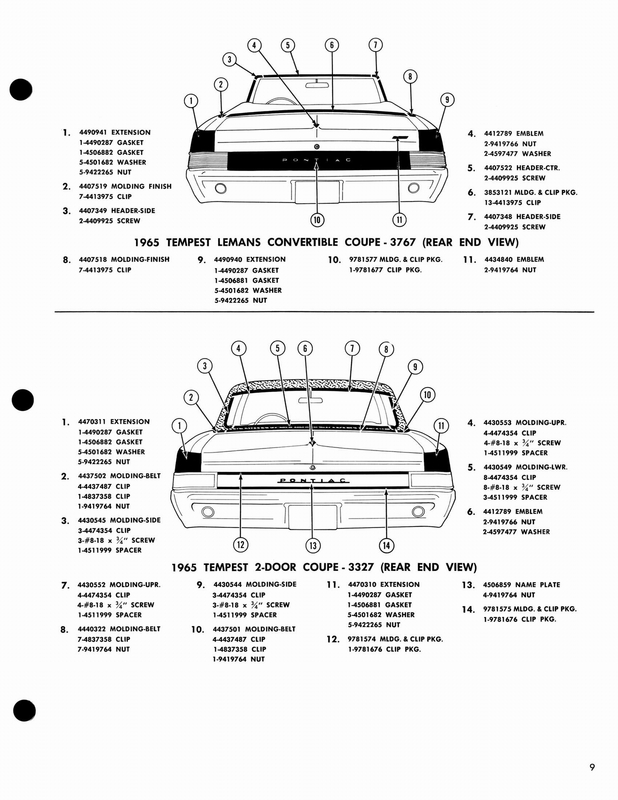 Hard to tell how exactly it all started, but the new 1964 ½ Mustang was for sure a Giant Leap on the road to the Muscle car period. 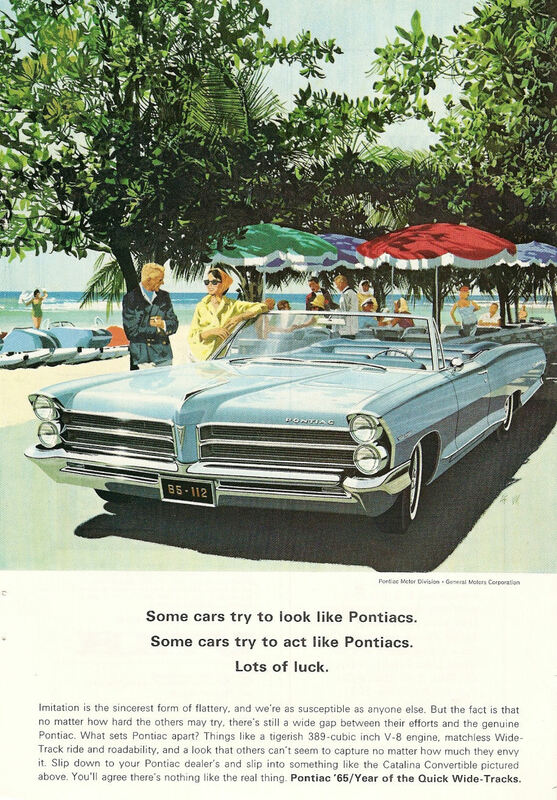 Pontiac was one of the contenders, and in some eyes the real McCoy and if you read further down in the history section, the sales numbers tell there own tale. 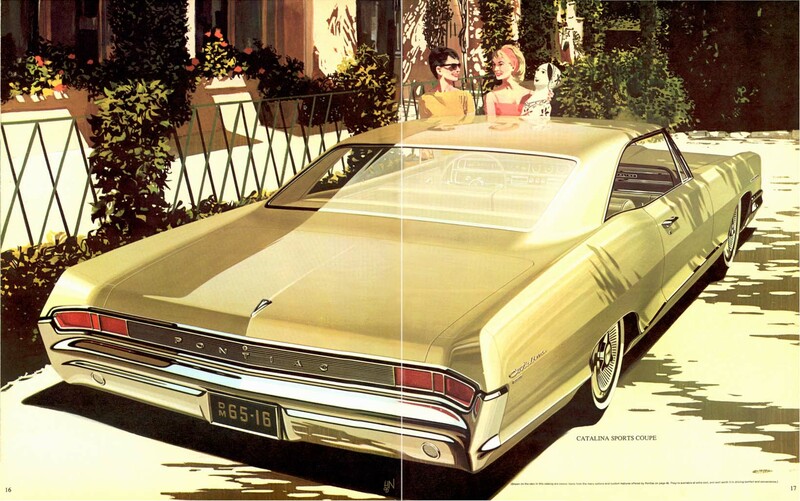 This car was huge popular and still is it today! 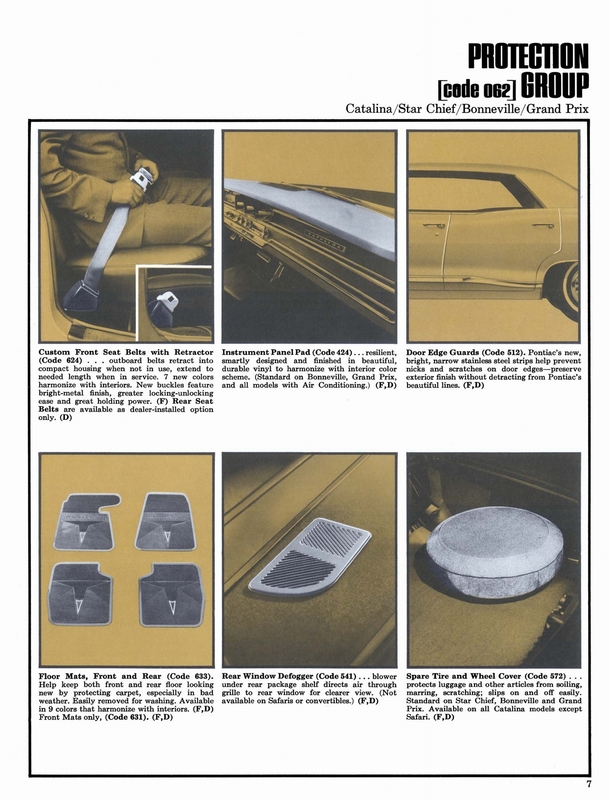 – If you want a pristine car with all the bell and whistles, prepare to pay a large six figure amount of your newspaper savings. 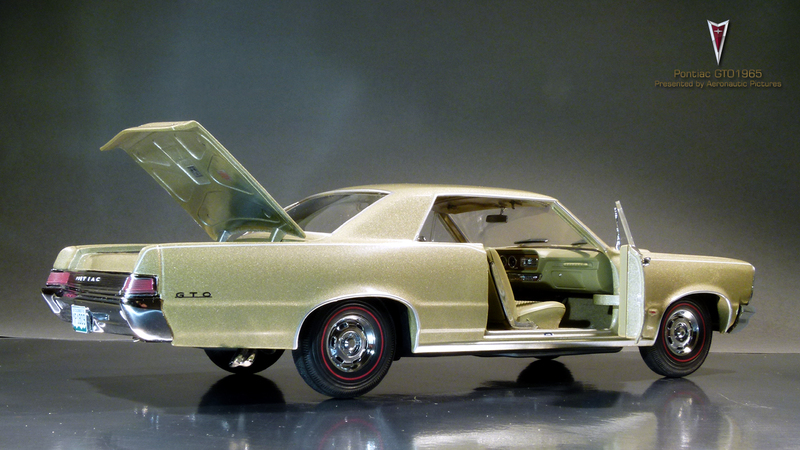 So it is no wonder why the Chinese manufacturer of Sun Star had chosen to replicate this famous car in scale 1:18. 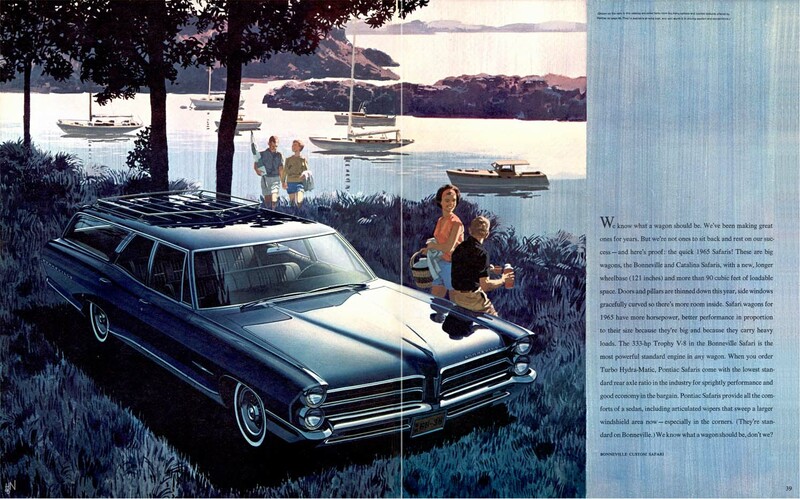 If you don’t have other plans will you come along for a ride? 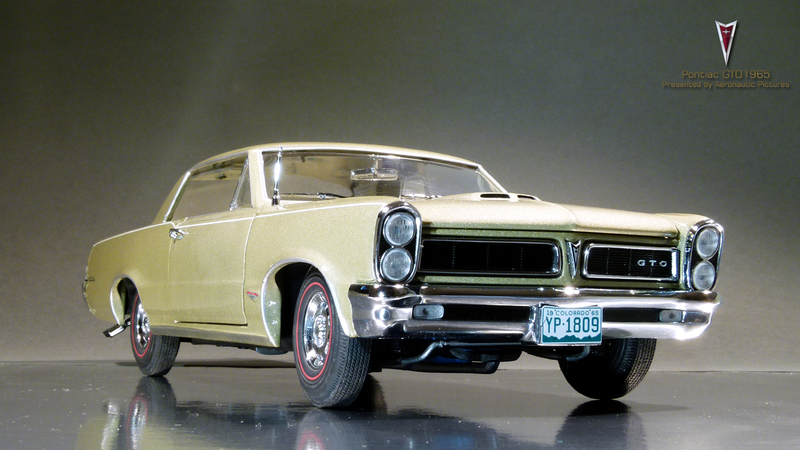 Sun Star has two series in scale 1:18 of US model cars: the Platinum for high details (and price) and the more budget entry in the USA Collectibles series as where our 1965 GTO is placed. 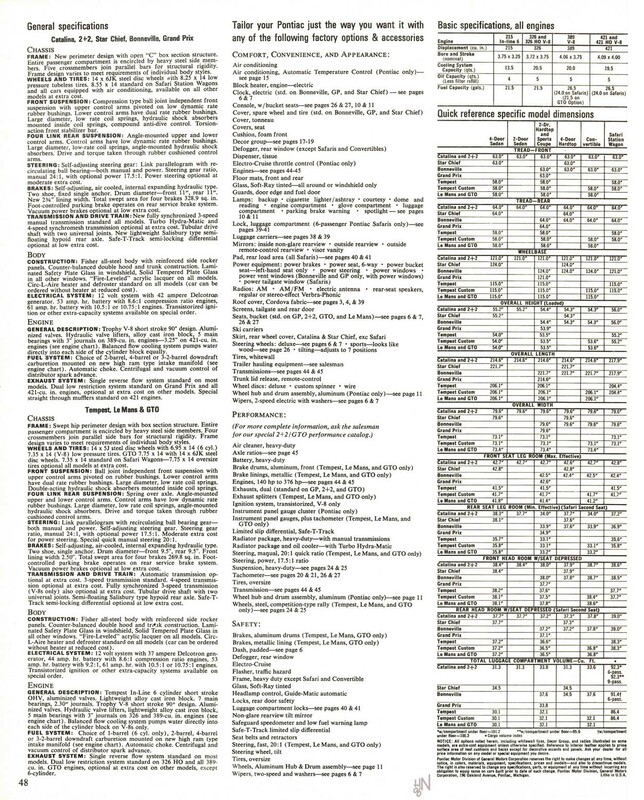 And as said before, price versus level of accuracy is the benchmark in this review and let’s have a closer look on all the features. 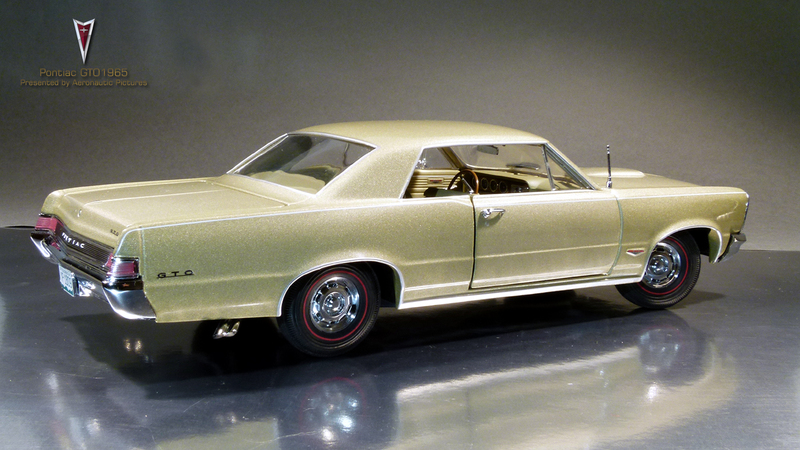 This particular model came in the Capri Gold livery – it is a strange name as the model appears more metallic light-green seen in daylight. 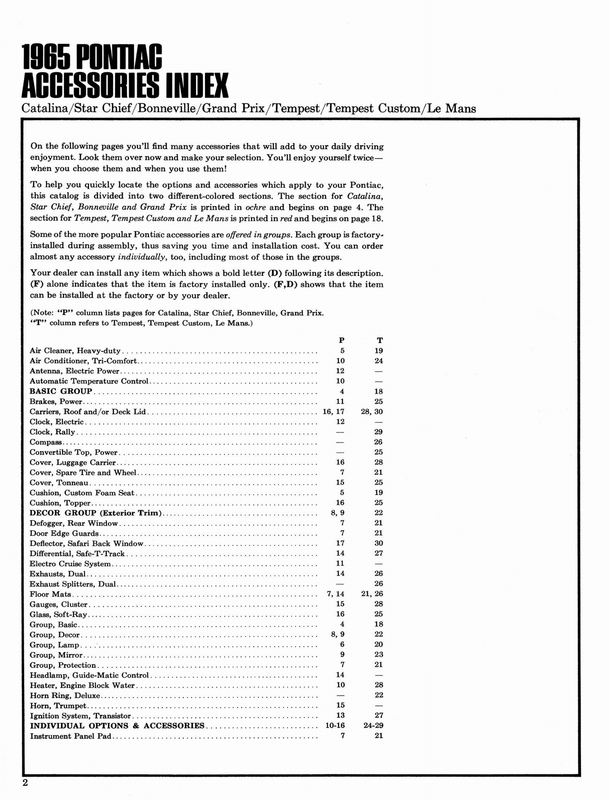 It is a matter of taste if one like this color and Sun Star has other colors to choose from. 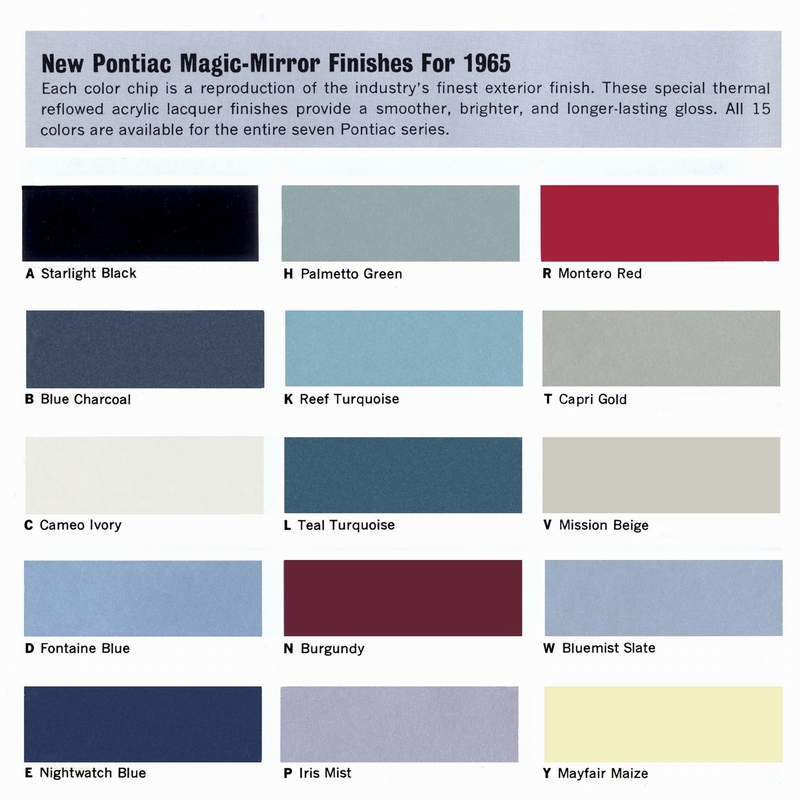 I don’t like the color – but again that just me. 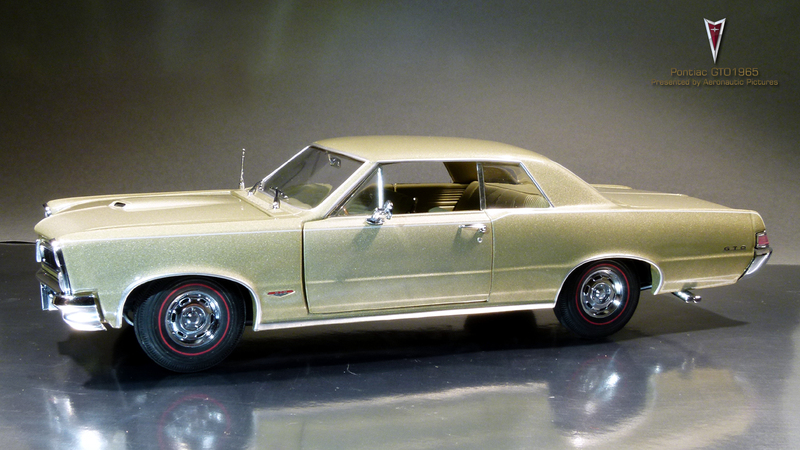 On the other hand; the paint work on this and other Sun Star’s models is always top dollars and I can’t find any flaws on this model so here is all thumbs up! 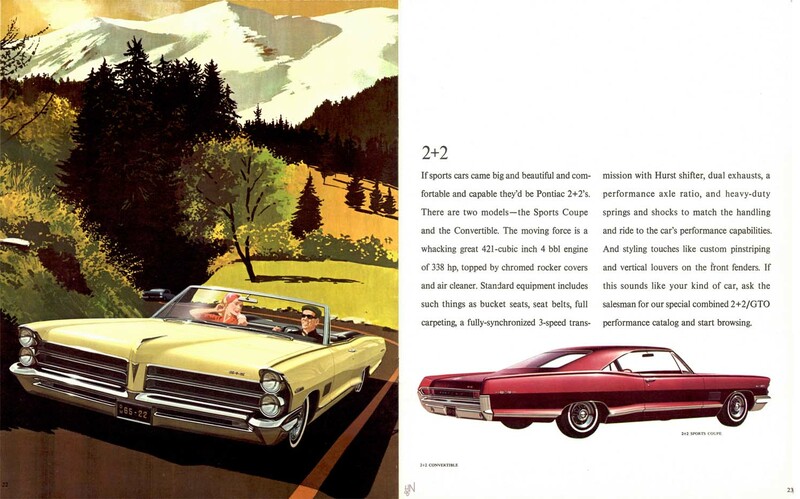 A true muscle car had to have good tires as you have to go fast ….and brake quickly too. 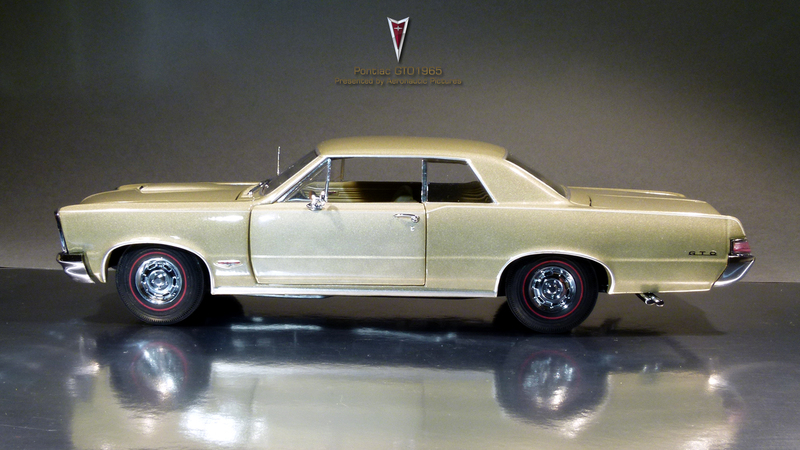 Sun Star models are known for the well detailed tires and wheels, and this tiger is no exception. 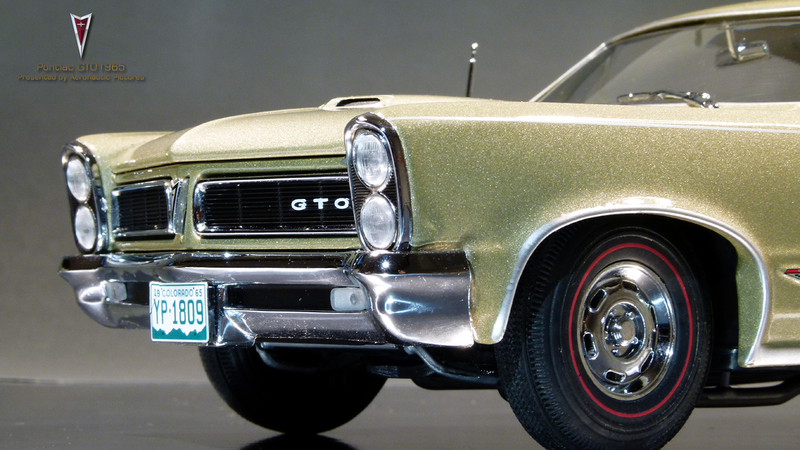 The redline tires was the most hype of its days and looks good with the rally hubs on this 65 GTO. 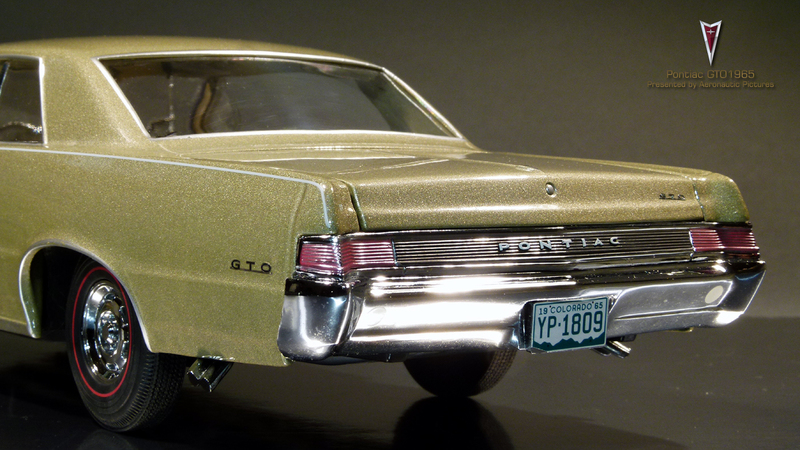 The model car has fine features like the etched-metal emblems around the body, otherwise often more seen on the Platinum series. 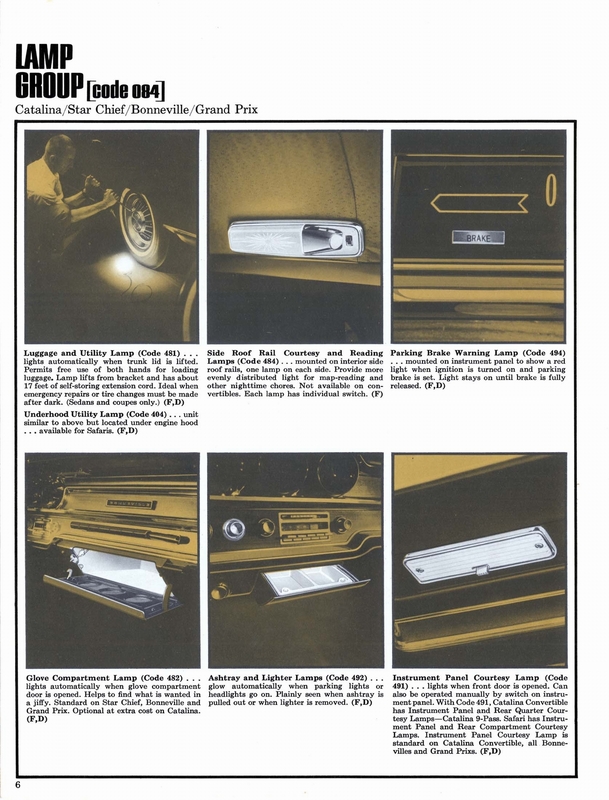 And as an extra plus, they are all embedded deep in the varnish and will not be ripped off by a keen” cleaning boy” at the “Gas station”. 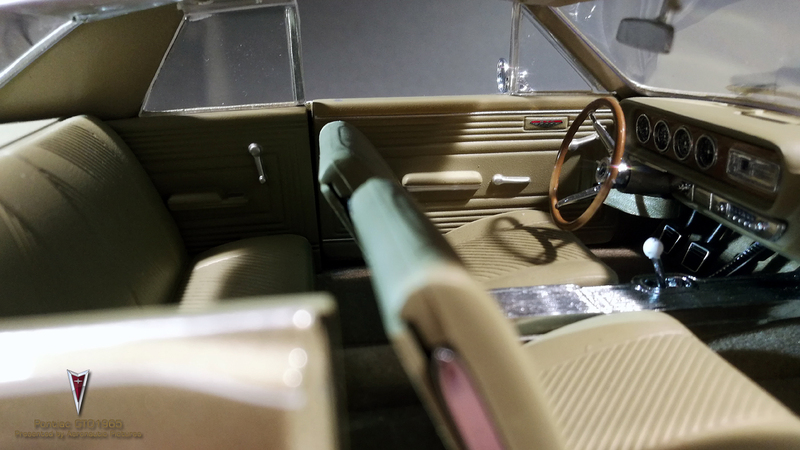 Details such as the windows and light lenses have a high quality feel, just have a look at the stacked head lights in the close up pictures, but if we take a look from behind the tail and park lights is only represented by paint. 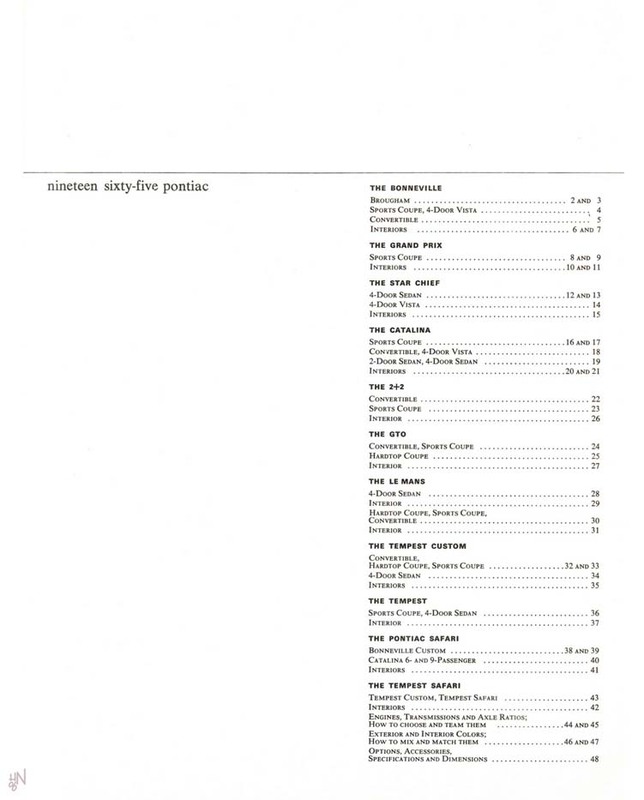 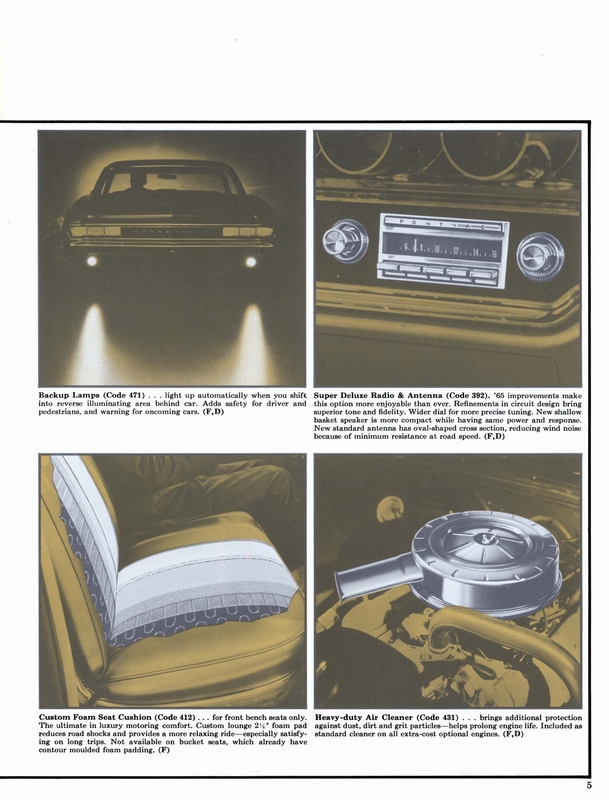 This is a bit disappointed as Sun Star models always else have remarkable model lamps on their models. 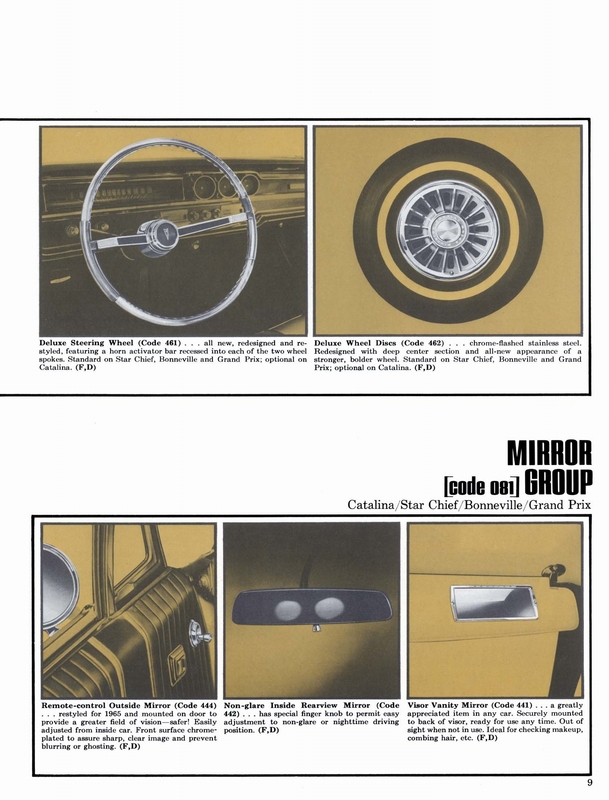 In 1965 the amount of chrome on cars was in its last years and took only a fraction of space compared to a few years before. 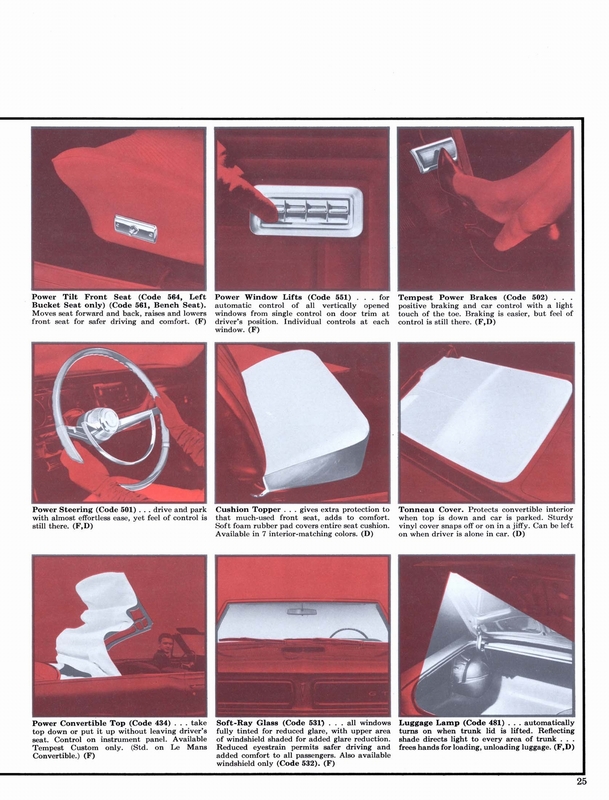 The square box look with only a hint of heydays chrome was fashion now. 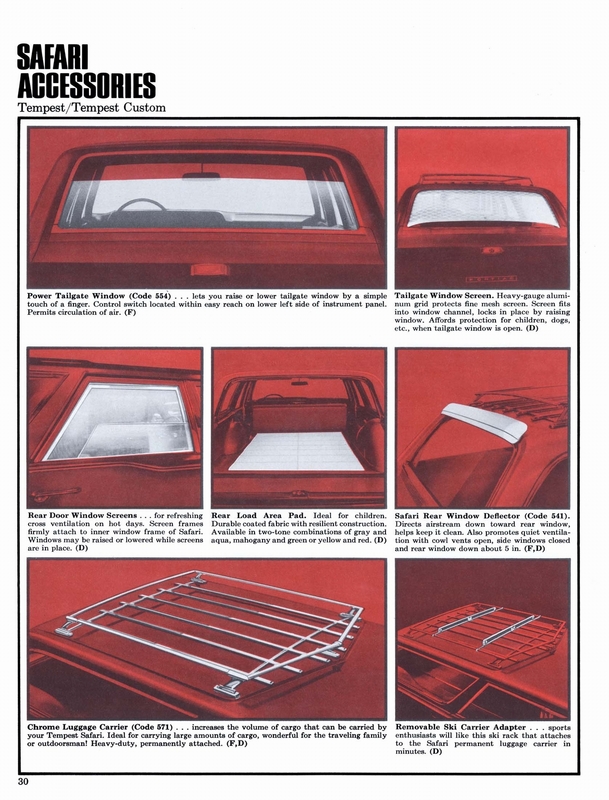 The only parts that carries chrome is the bumper front and back, beautiful made here by Sun Star. 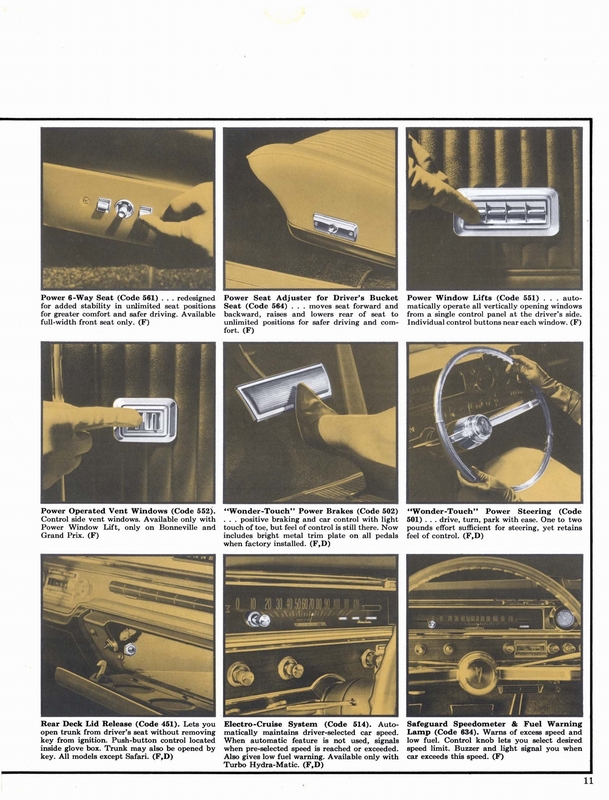 BUT ..there is a but: all the chrome trim work around the windows is only silver paint! 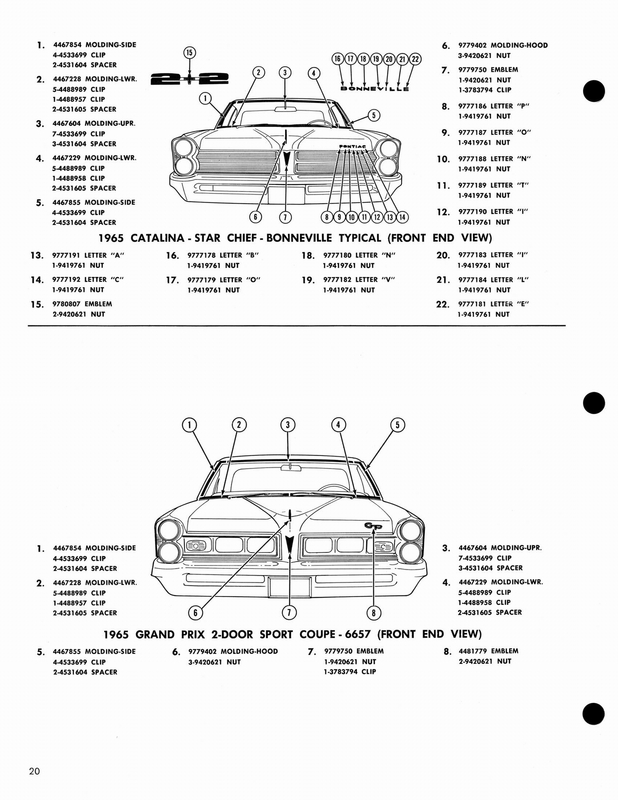 And the same around the wheels wells. 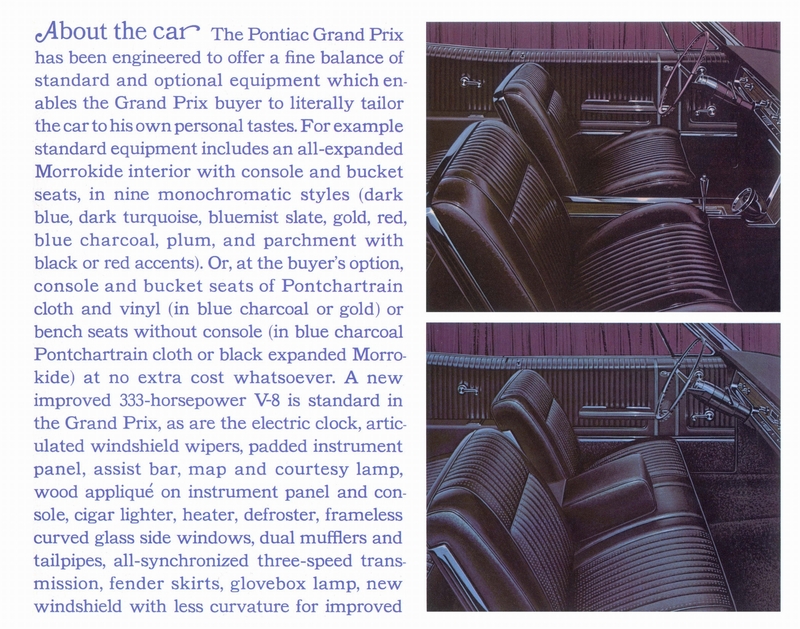 This is a shame, also when we know Yatming models, at under half of the price, always have “real chrome” around the windows. 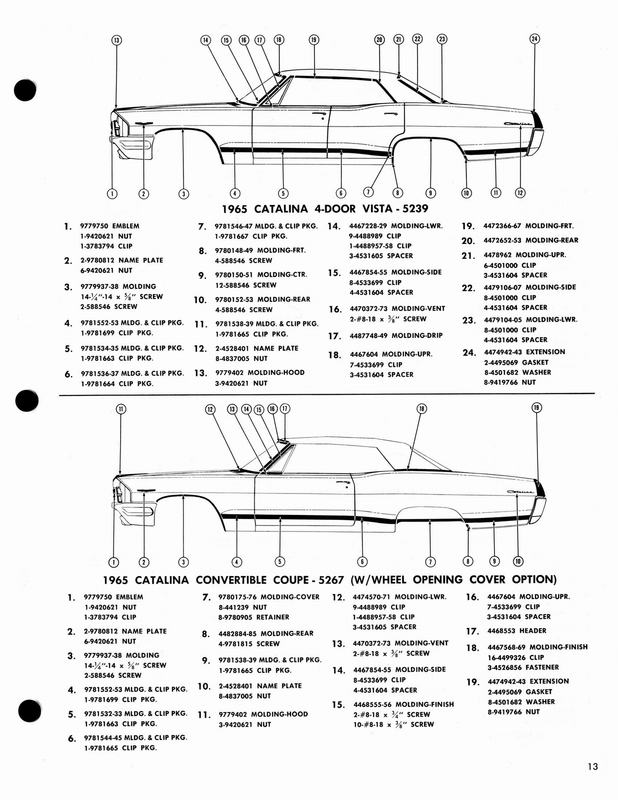 No model review is finish before we have looked inside! 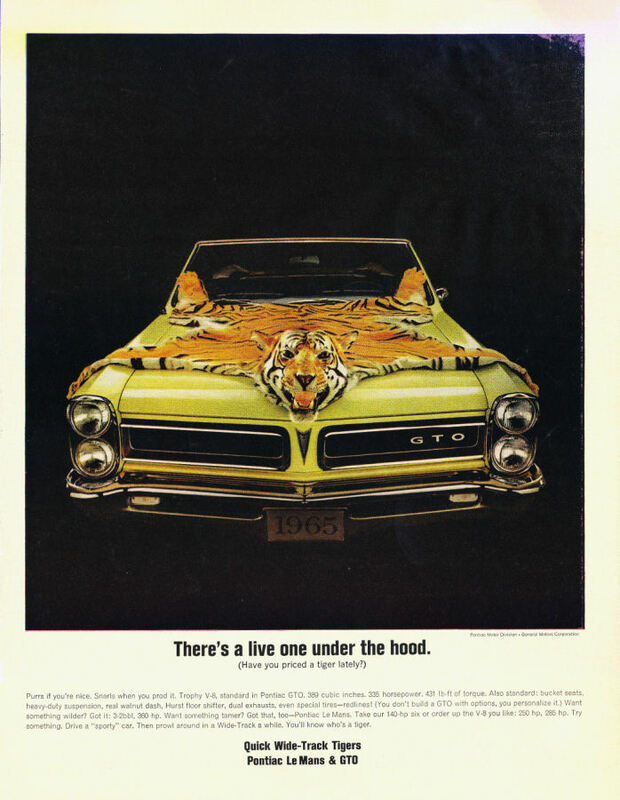 So let’s open the hood and see if there is a live tiger under! 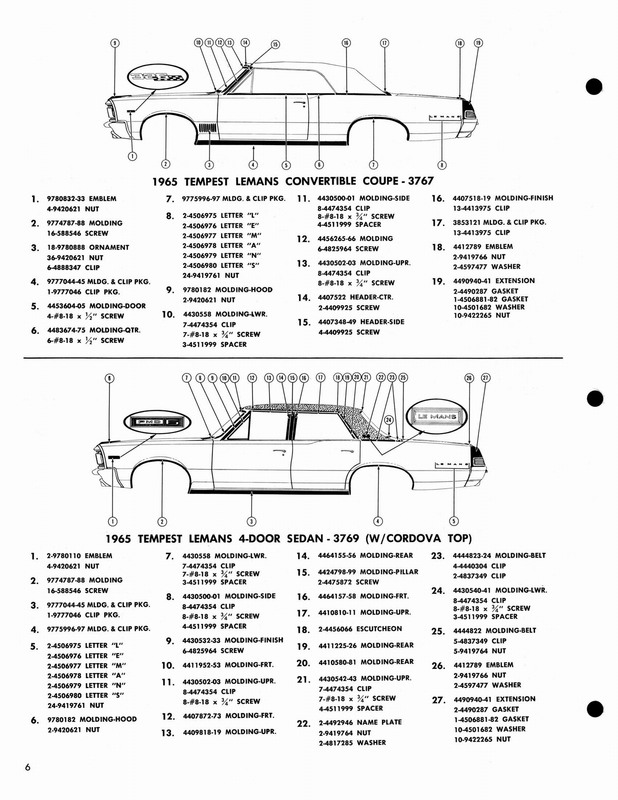 Alive I’m not sure, but the details of the big Pontiac 360 Hp triple carburetors. 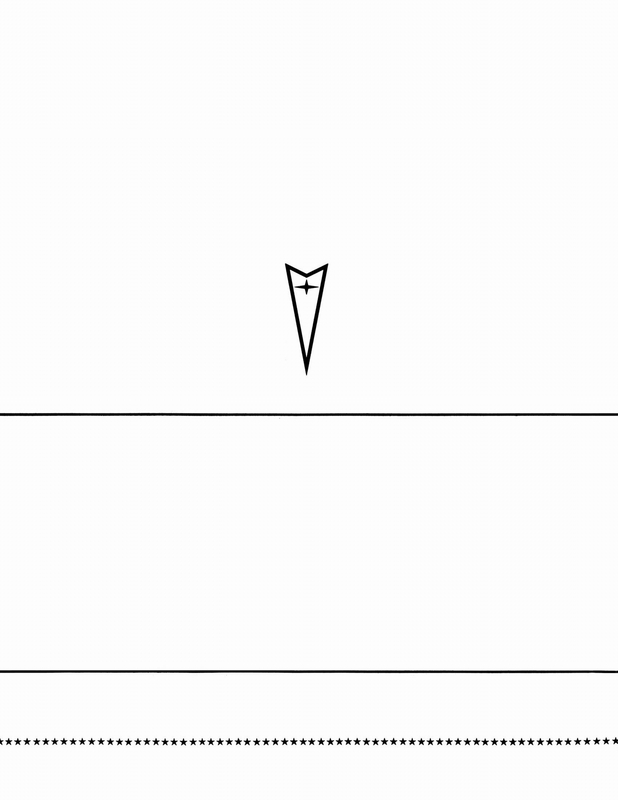 -Are very amazing. 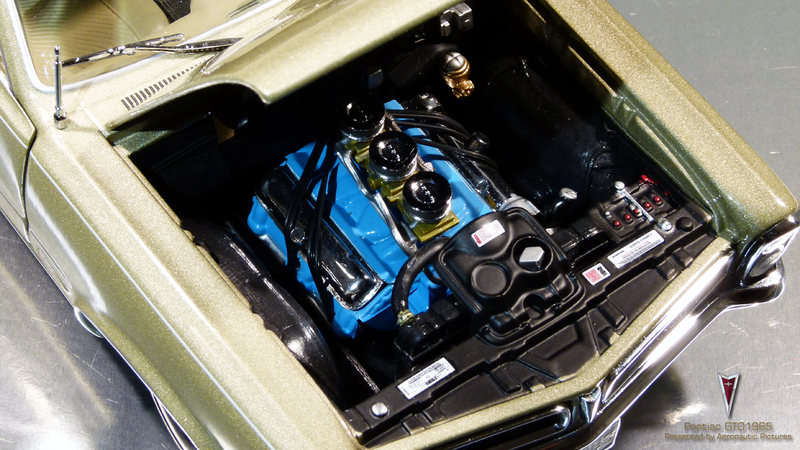 Here we see all the wires and stickers and the air filters in chrome stand well to the light blue engine block. 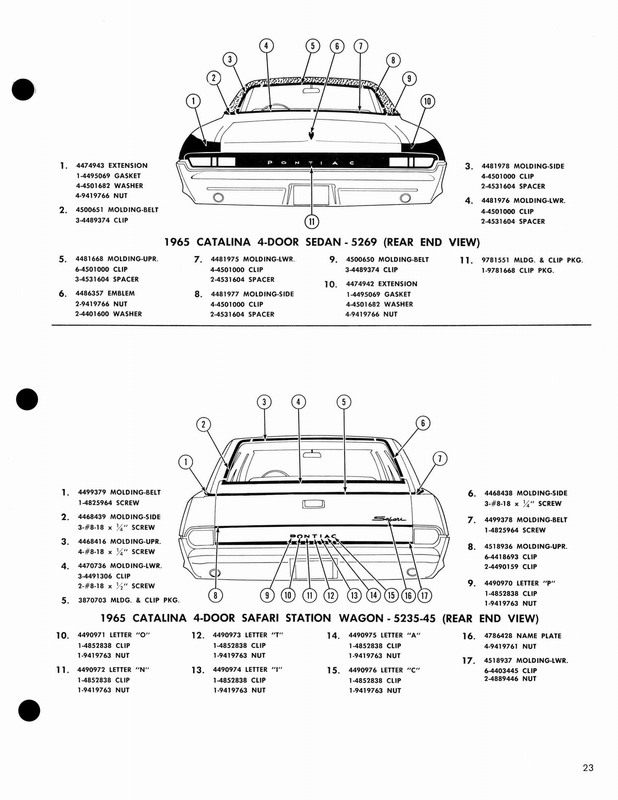 Come along to the rear and open the deck lid. 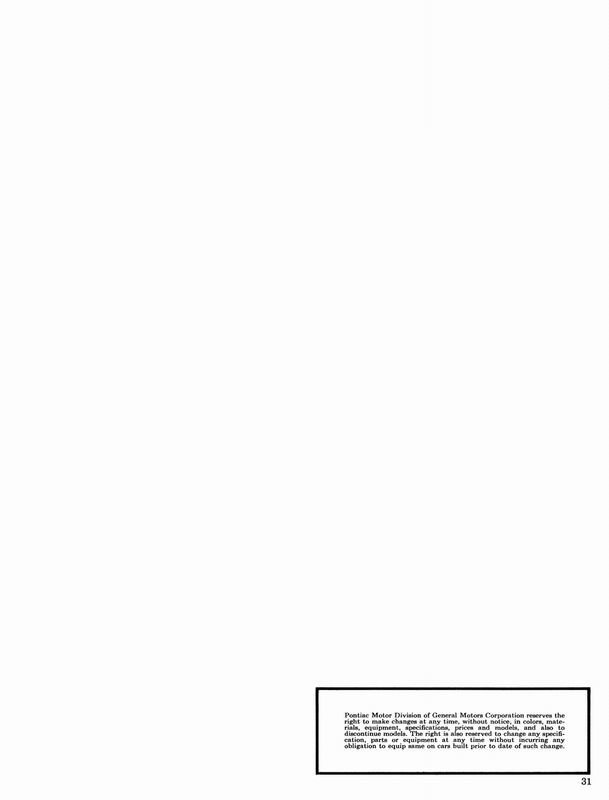 Here we find space of a small apartment. 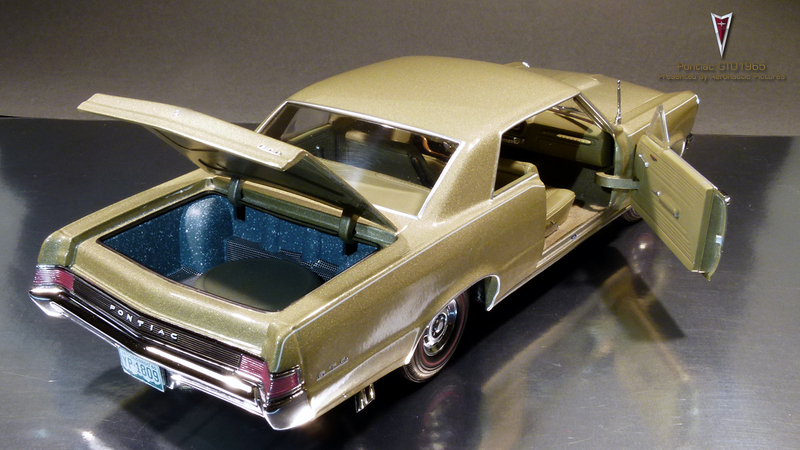 In here a vinyl carpet reside along the spare wheel under a cover. 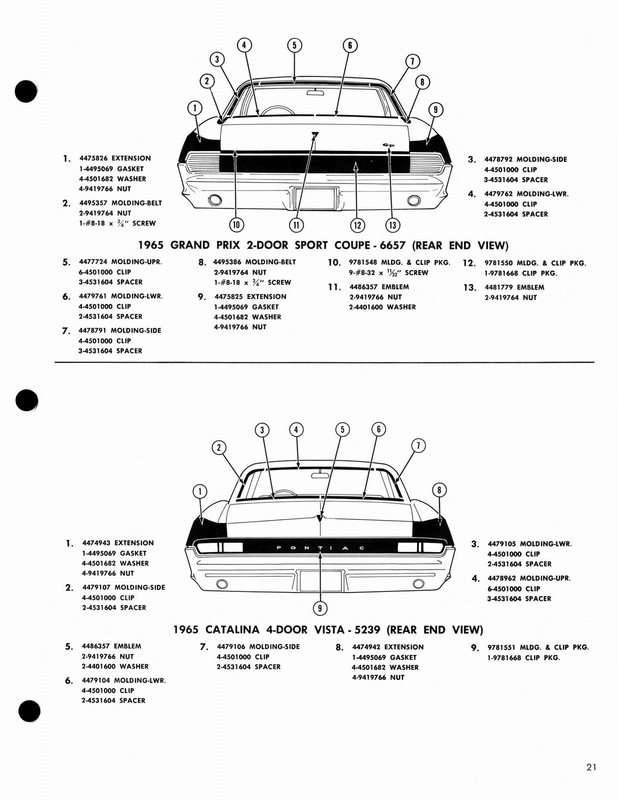 The underside of the deck lid has stickers as manuals to use the jack for tire (wheel) change etc. 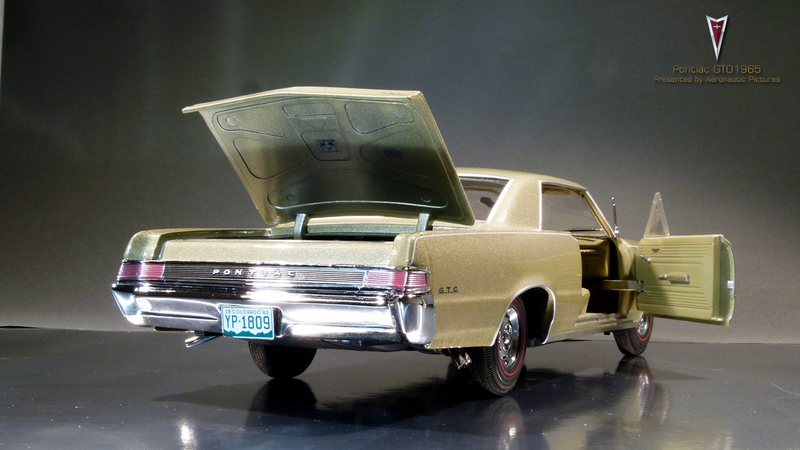 All in all; fine for a model car in this price class. 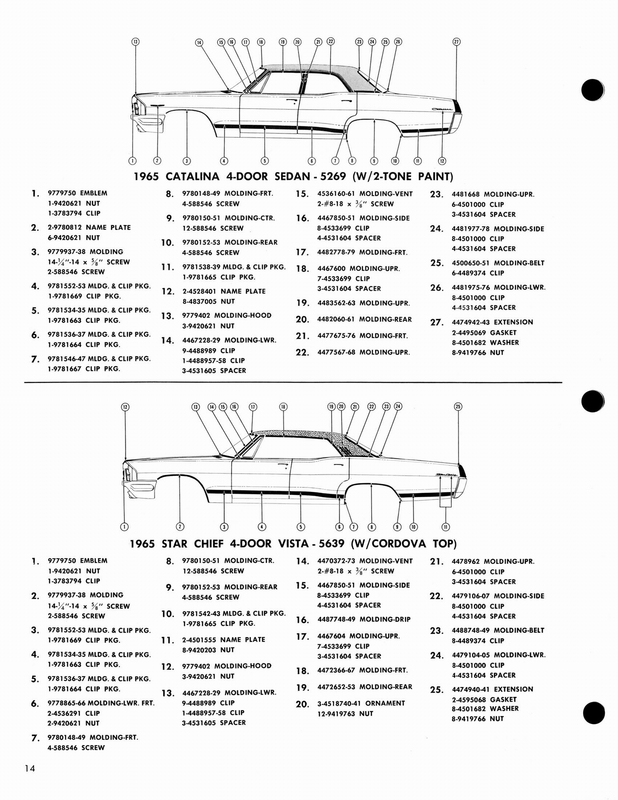 The last part of the tour is the cabin. 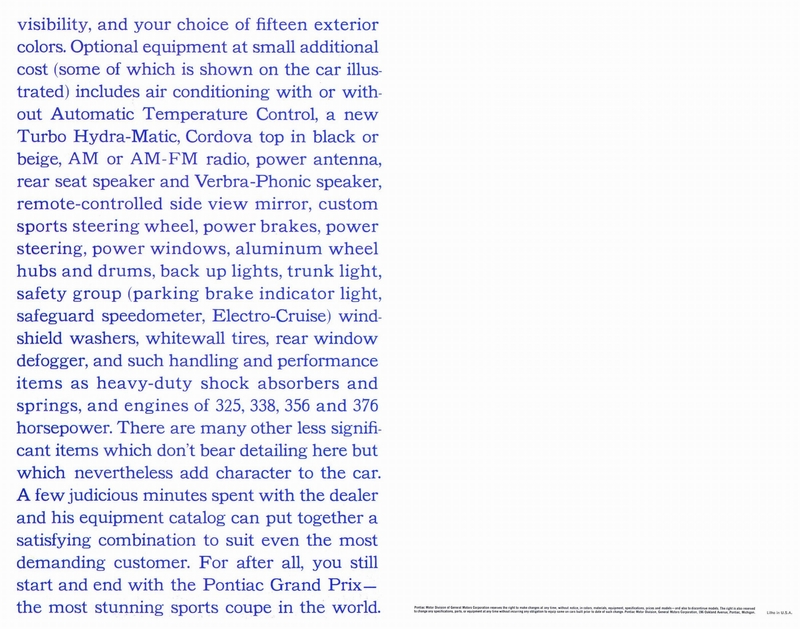 Here is all what you can whish for in this price segment. 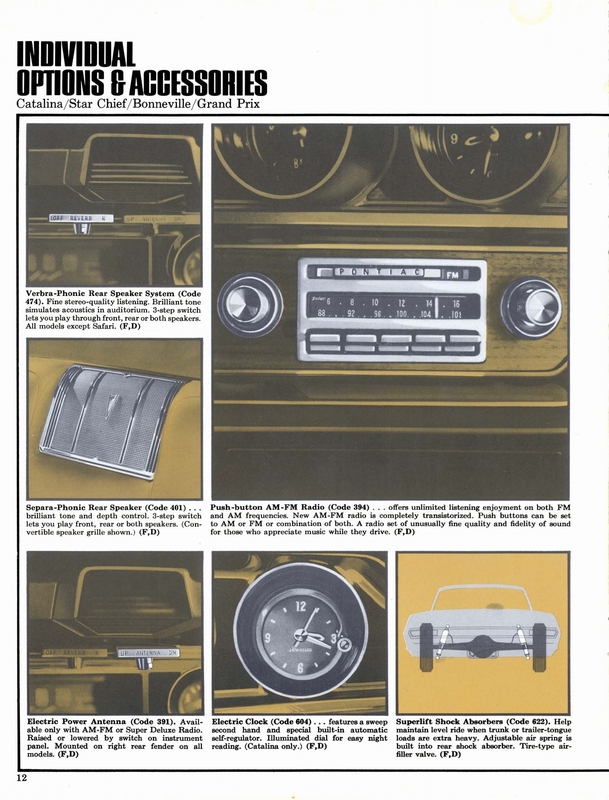 Sun Star really shines here, just look at the instrument panel and radio dials etc. 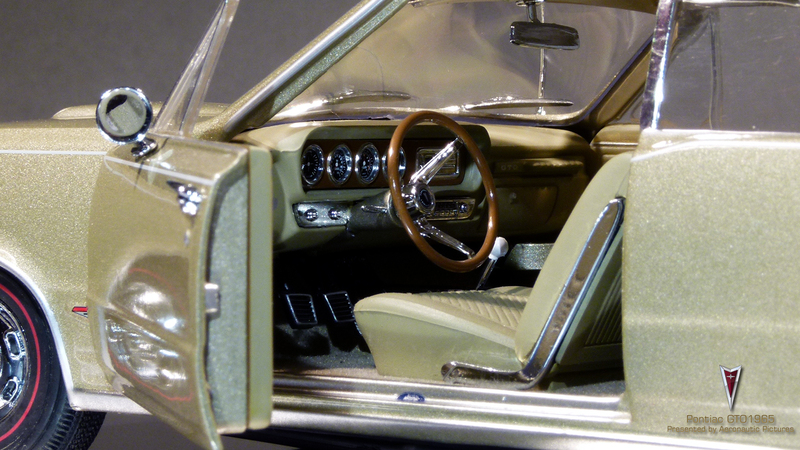 The matching color carpet, the gear shifter and last but not least the steering wheel in wood and chrome. 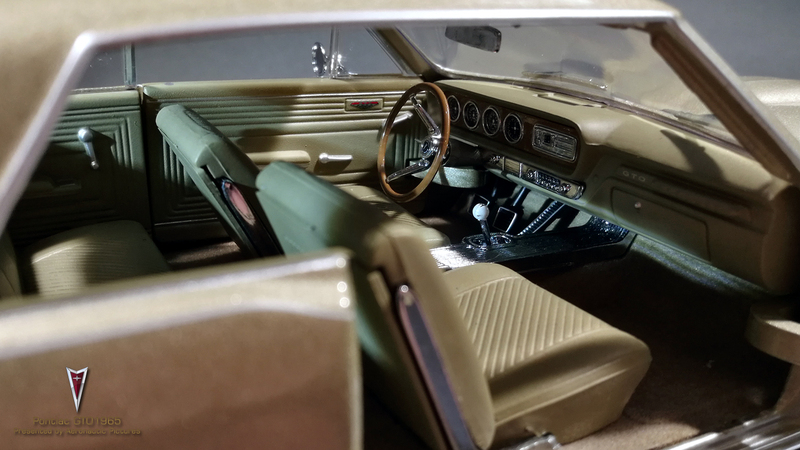 This interior is very good and gives a realistic feel of the mood one could came in, when someone were the boss in this 1965 Pontiac GTO. 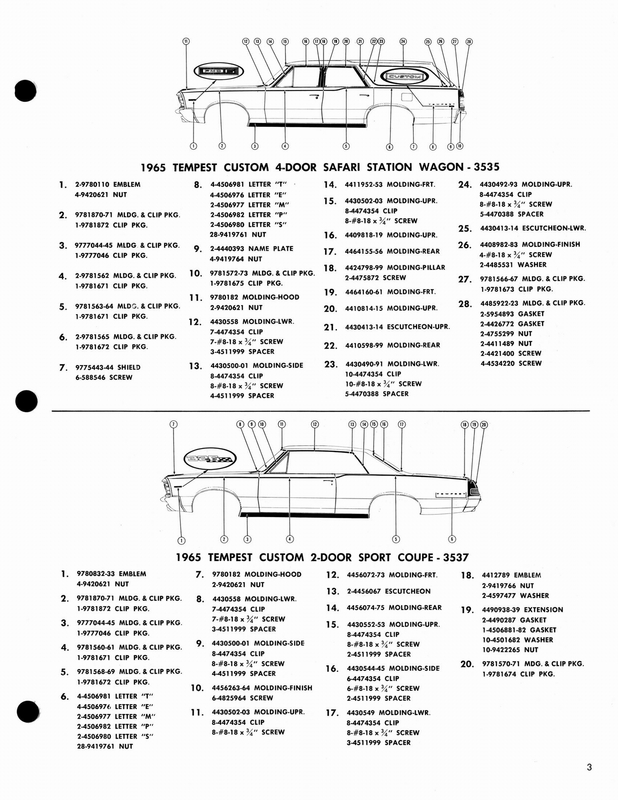 Now you can also be a prod owner of one of the times most famous Muscle car ever. 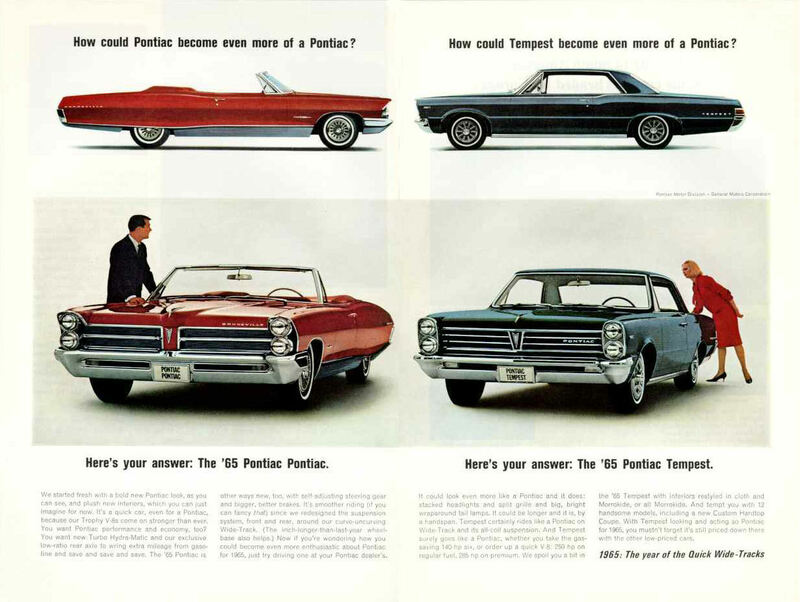 Model year 1965 was significant for Pontiac. 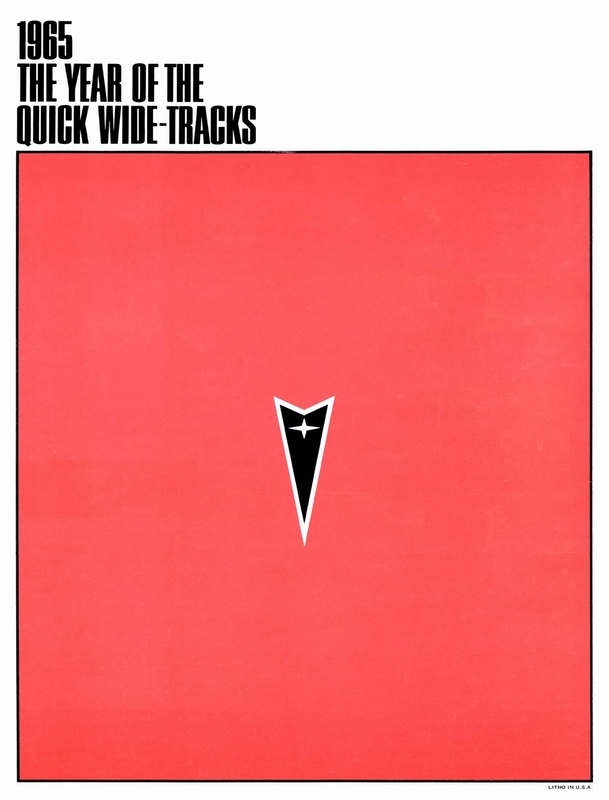 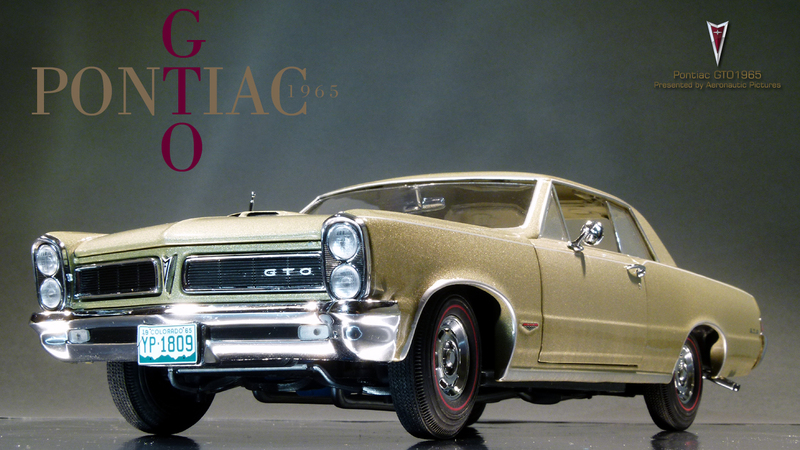 With 32,450 GTOs sold for 1964, the successful combination of styling, performance, image, price, and available options forced Divisional siblings and other automakers to play catch up. 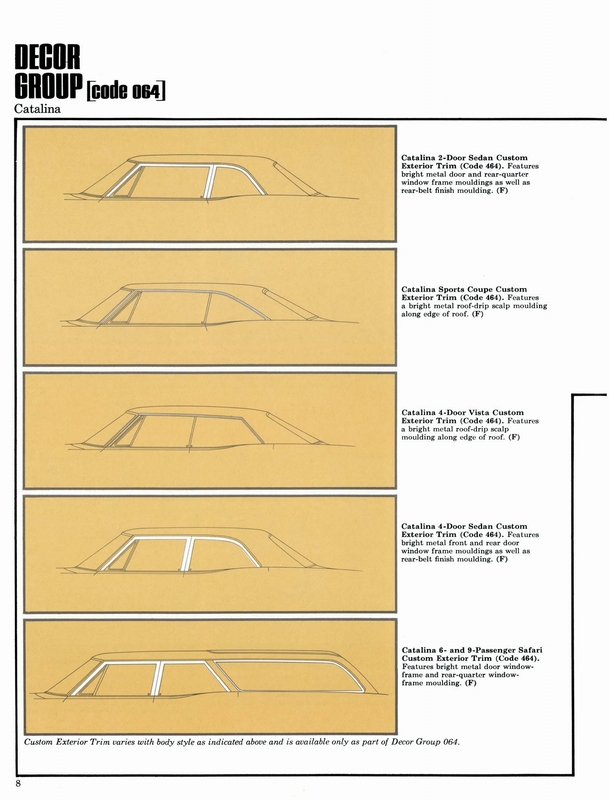 PMD recognized from the start that it would have a jump on the competition, so it wasn't about to relinquish its lead by easing up on development. 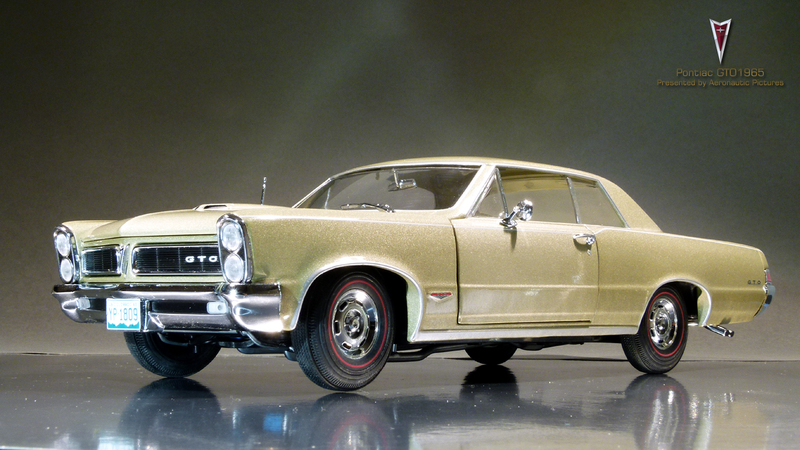 Consequently, the revised 1965 GTO captivated potential buyers with a modernized appearance front and rear, and additional power under the hood. 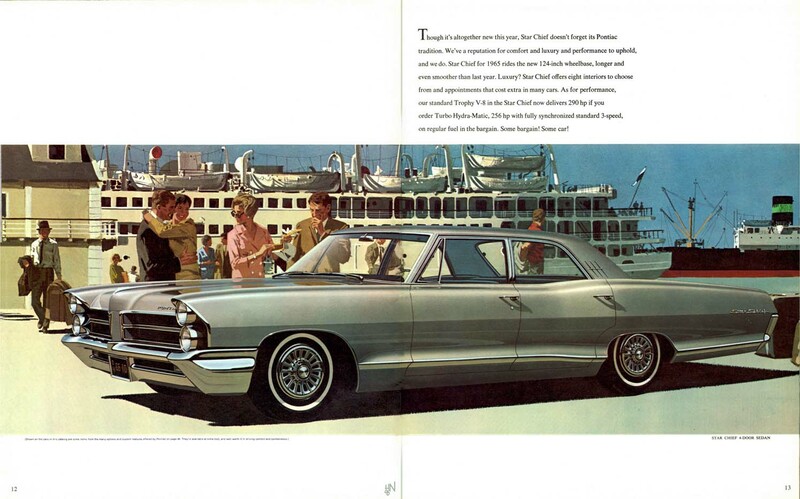 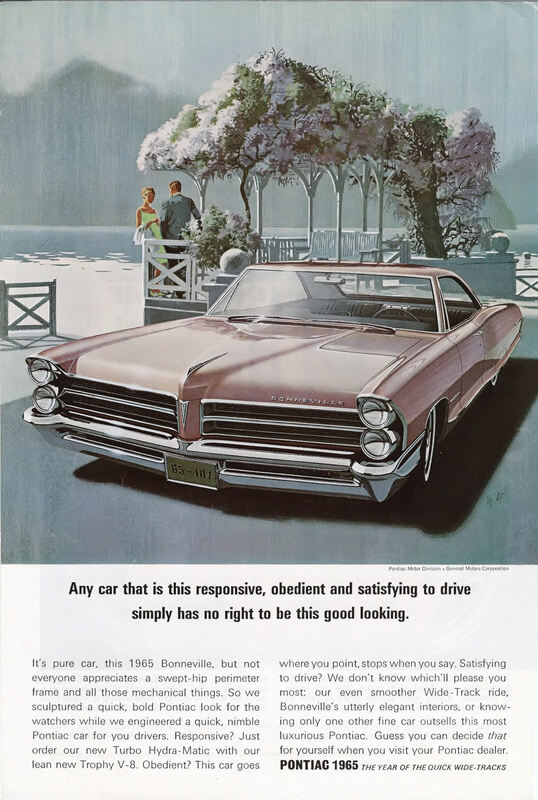 While the Division was basking in mostly positive press, such as having the Motor Trend Car of the Year award bestowed upon the entire Pontiac lineup for 1965, there were far-reaching executive decisions afoot at GM, as well. 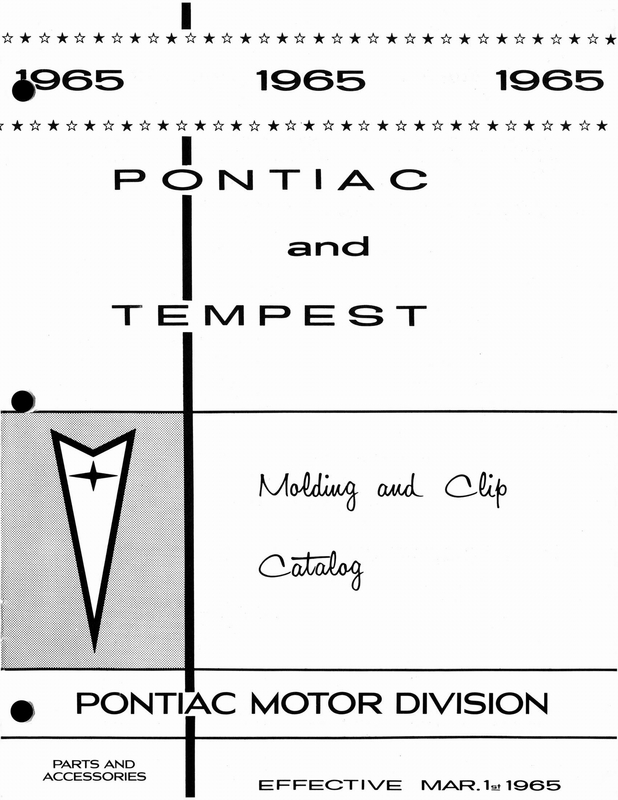 General Manager "Pete" Estes was promoted to Chevrolet's big chair in July, and chief engineer and father of the GTO, John Z. DeLorean, ascended to the top position at Pontiac. 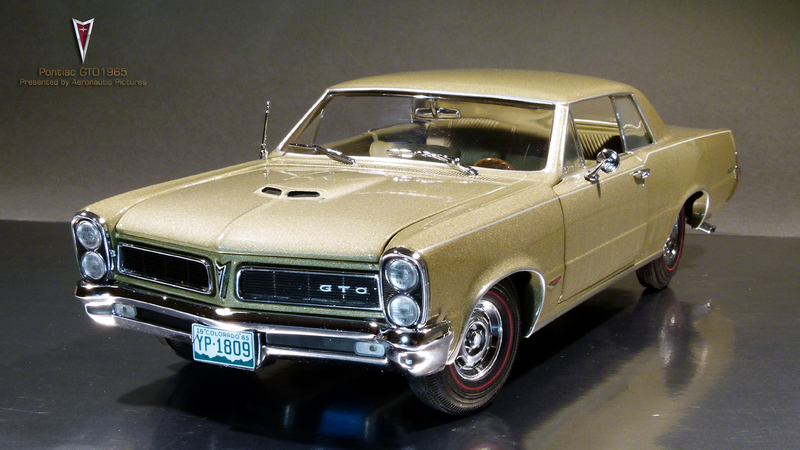 By model-year end, GTO production had more than doubled to 75,352. 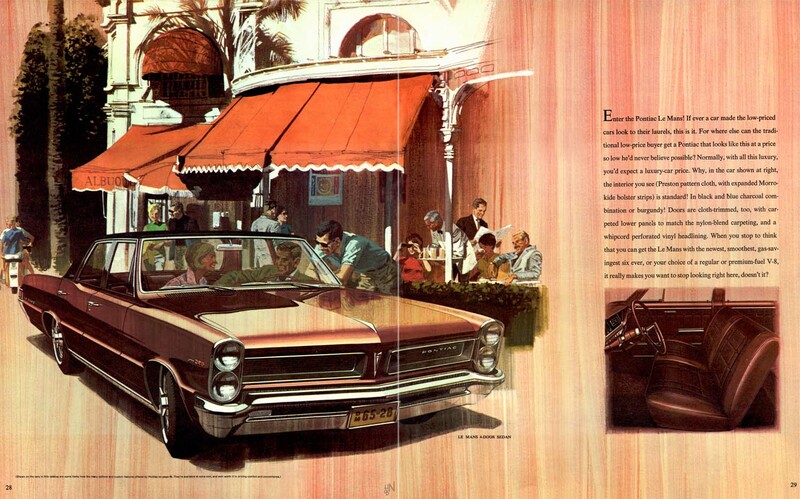 The muscle car was quickly emerging as a lucrative sales niche. 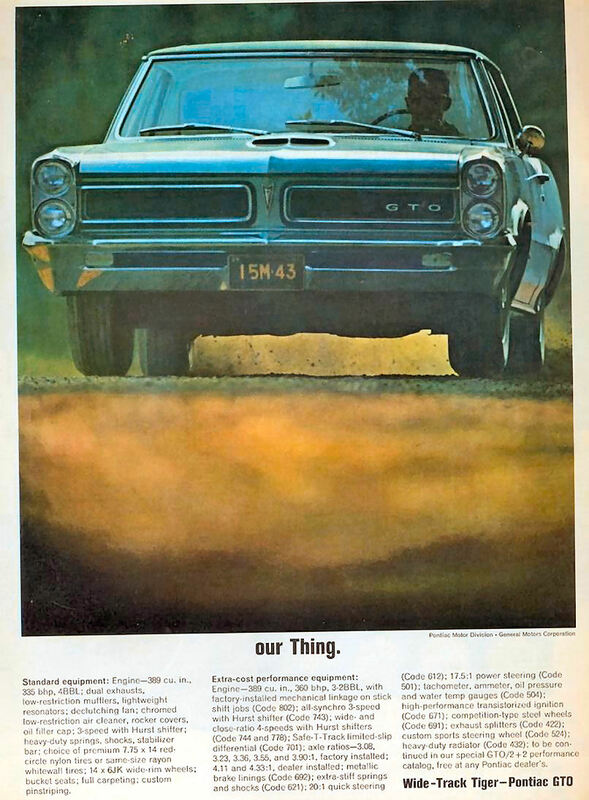 The code 382 (UPC W62) GTO option for 1965 came with a 389 four-barrel engine; dual exhaust; chrome rocker covers, oil filler cap, and air cleaner; HD battery; seven-blade declutching fan; floor-shifted three-speed manual transmission; 3.23 rear gears; HD suspension; and redline tires. 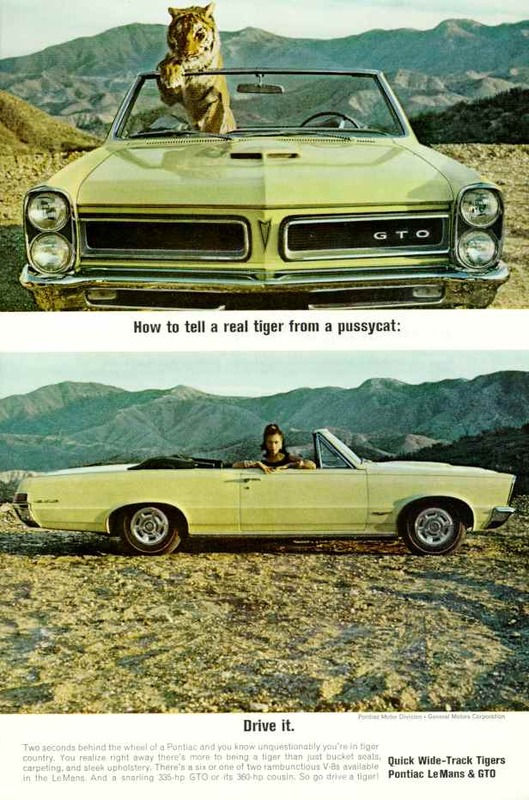 It also featured a hood scoop (non-functional), pinstripes, "GTO" lettering in the driver-side grille and on the quarter panels and deck lid, GTO crests on the front fenders and door panels, and woodgrain on the instrument panel. 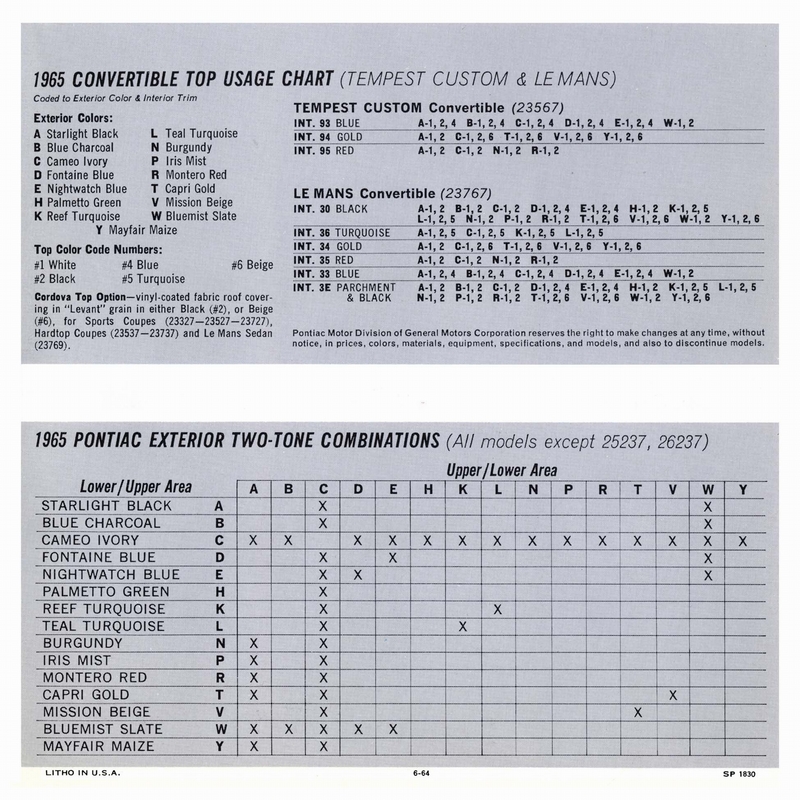 It added $295.90 to the base price of the Le Mans sports coupe, hardtop, or convertible for a total of $2,786.90, $2,851.90, and $3,092.90, respectively. 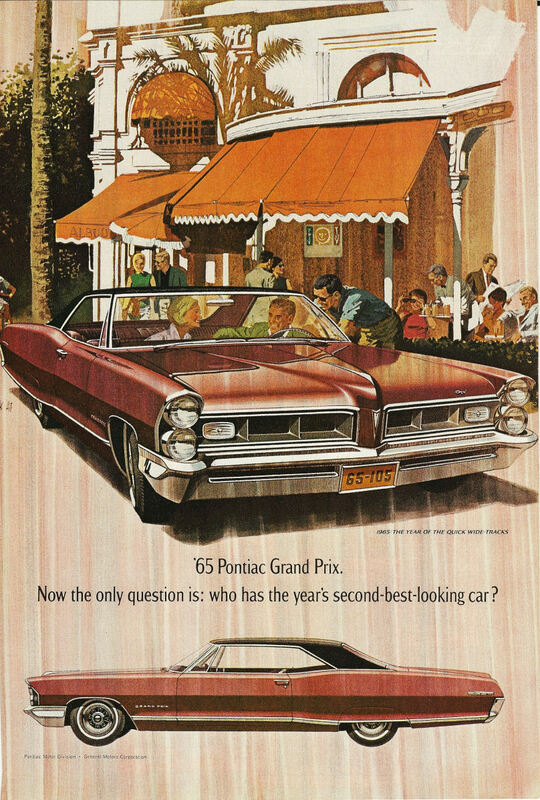 Bear in mind that prices may have been adjusted during the year. 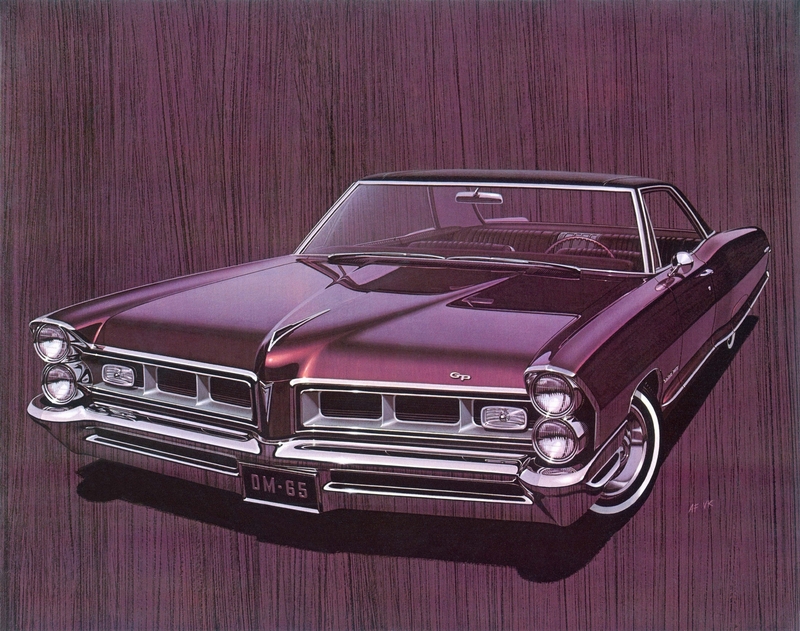 Since the GTO was ordered on the Le Mans, its features, like recessed split grilles, bucket seats, the Deluxe two-spoke steering wheel, and more, were also included. 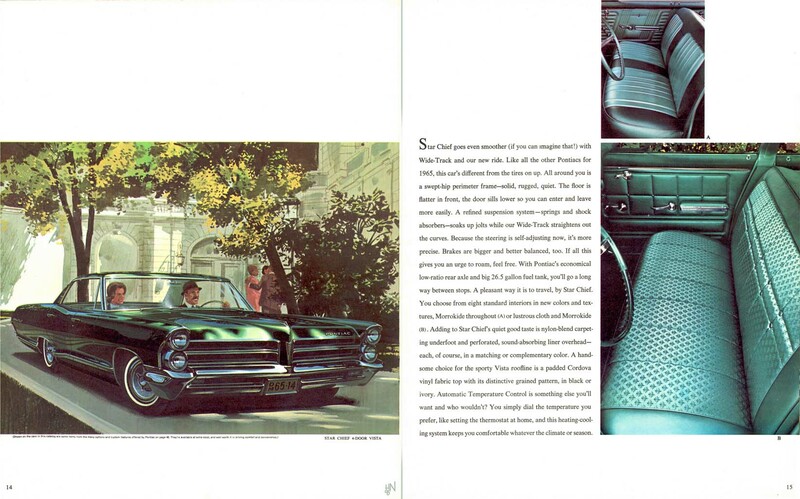 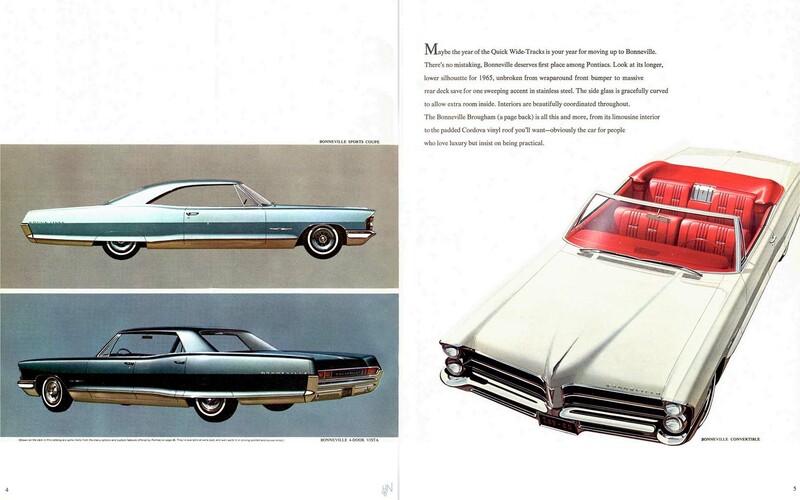 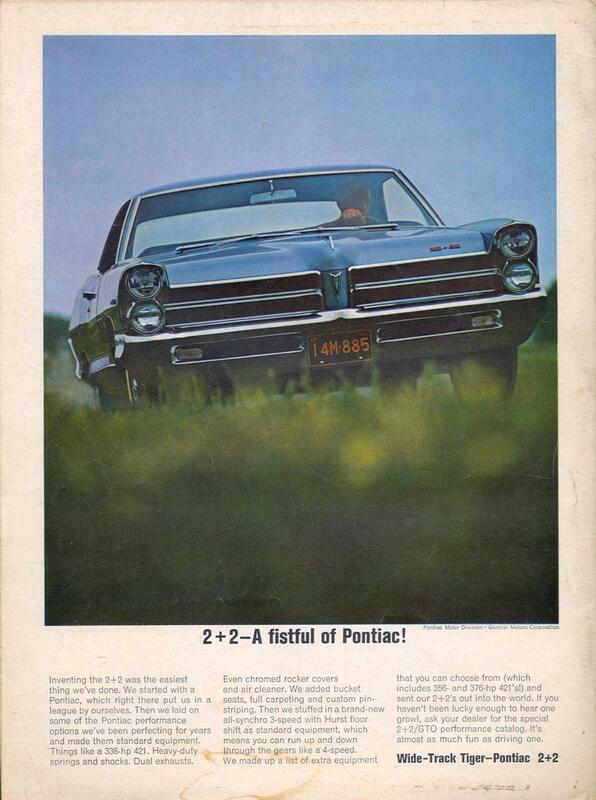 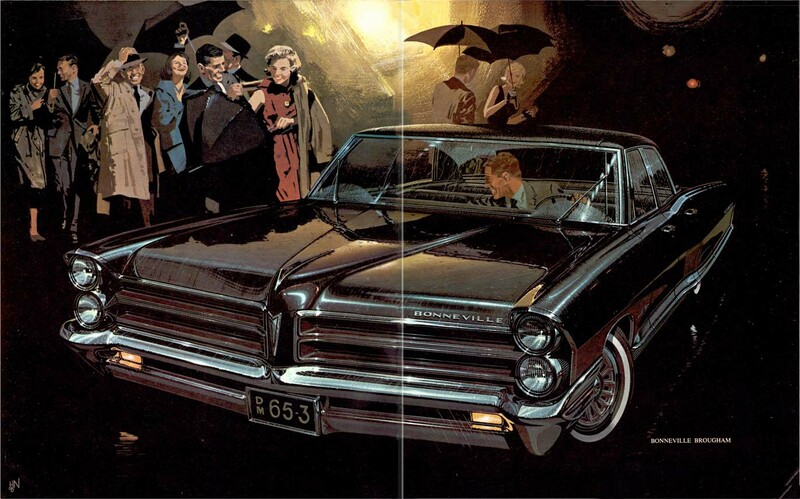 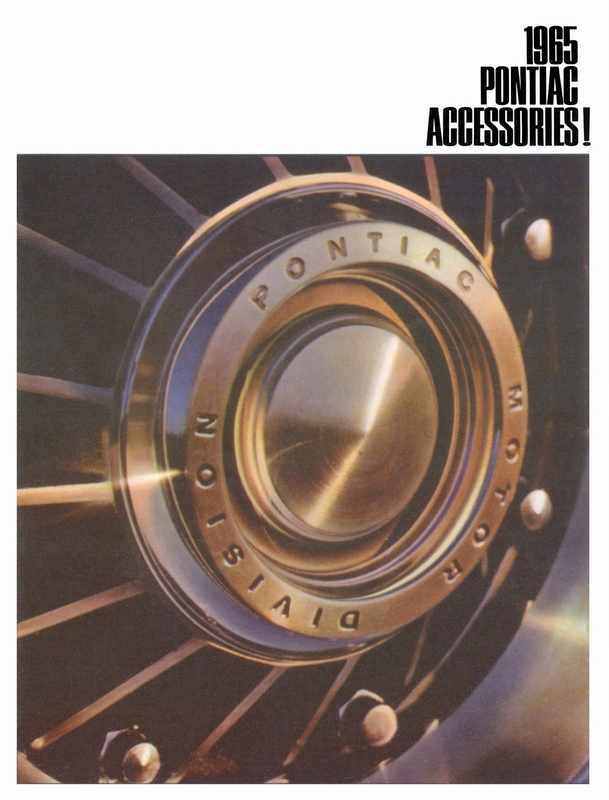 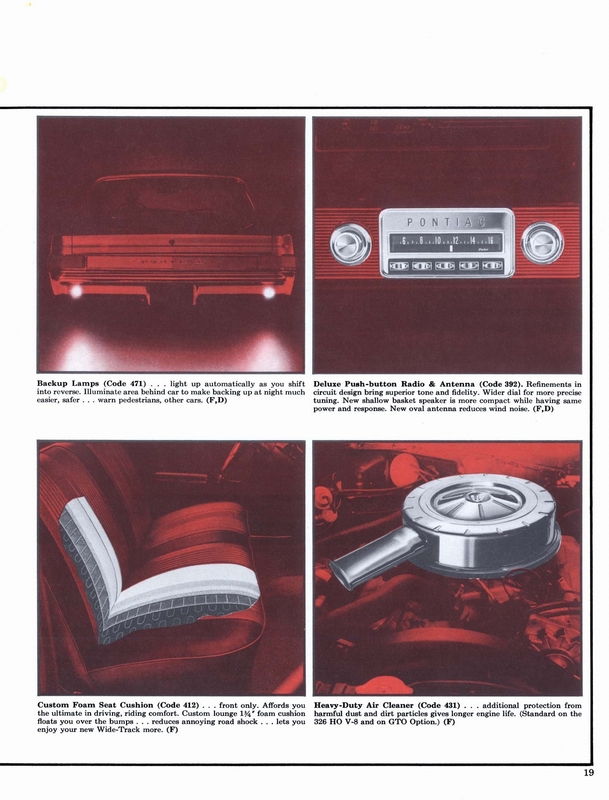 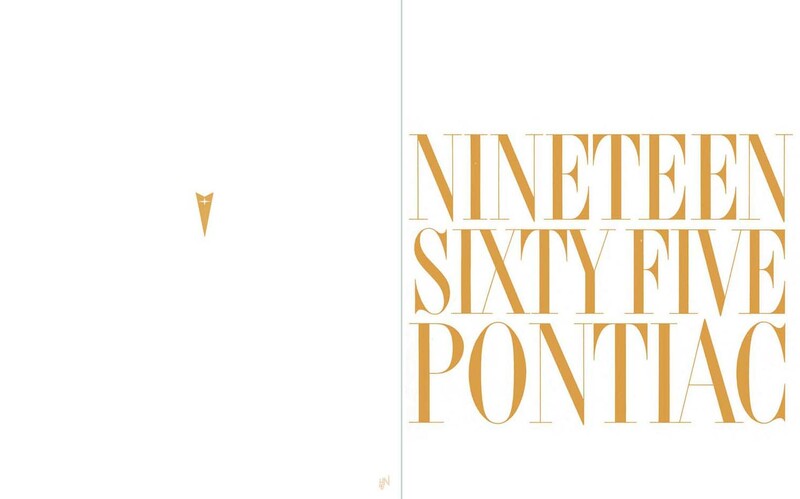 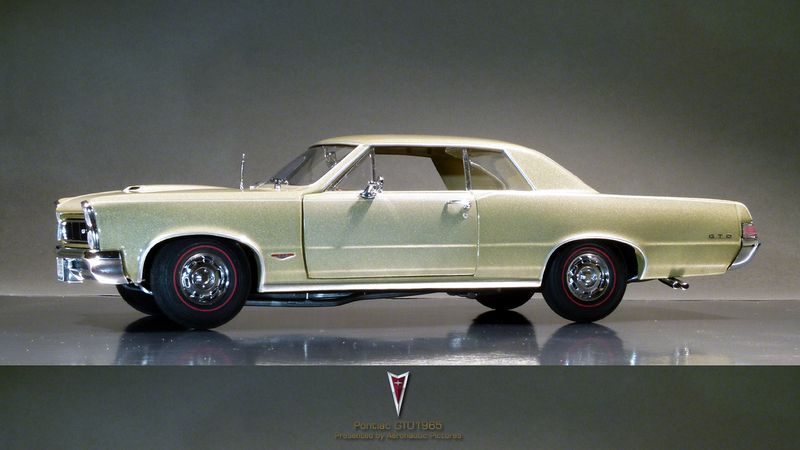 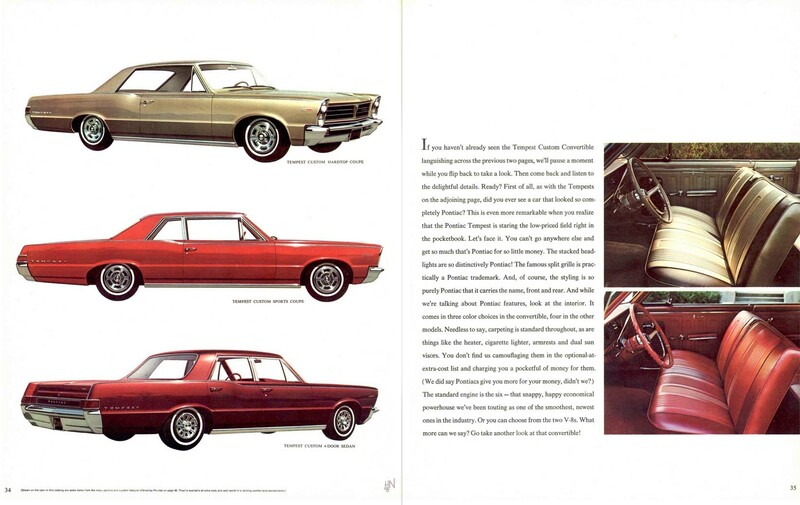 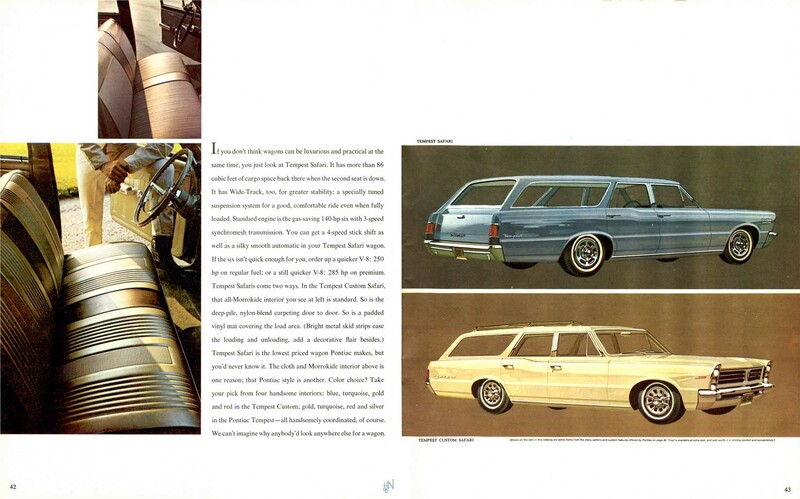 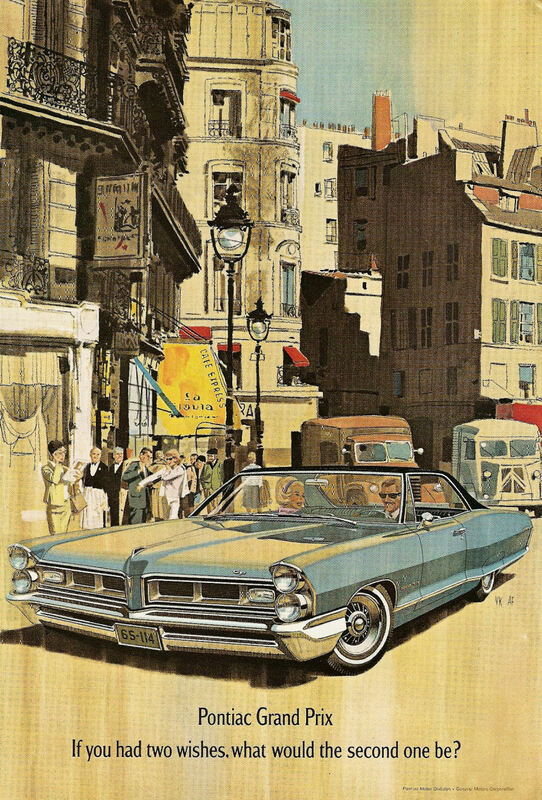 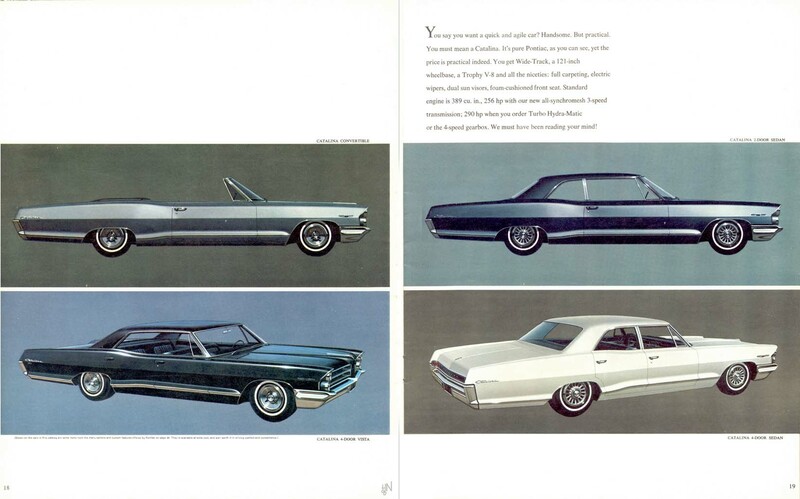 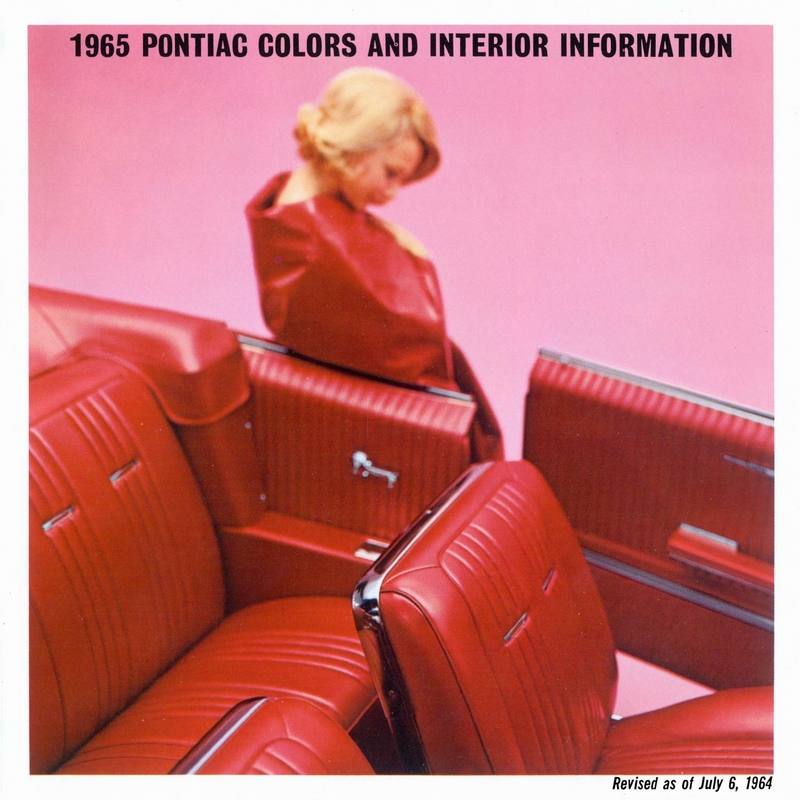 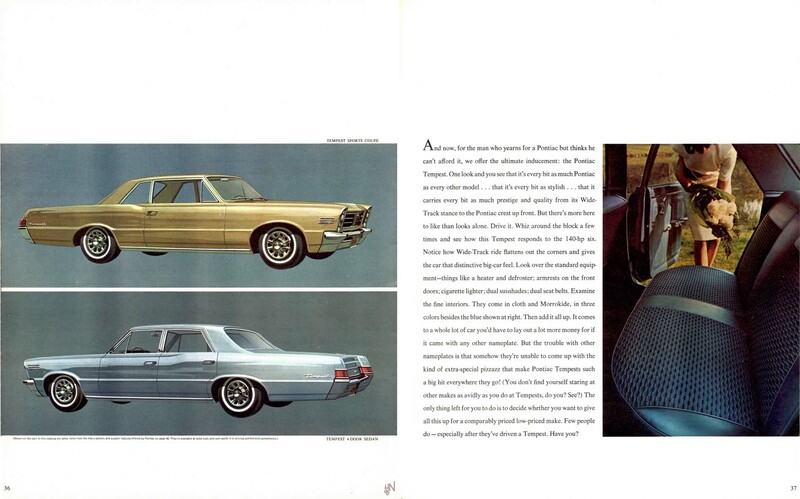 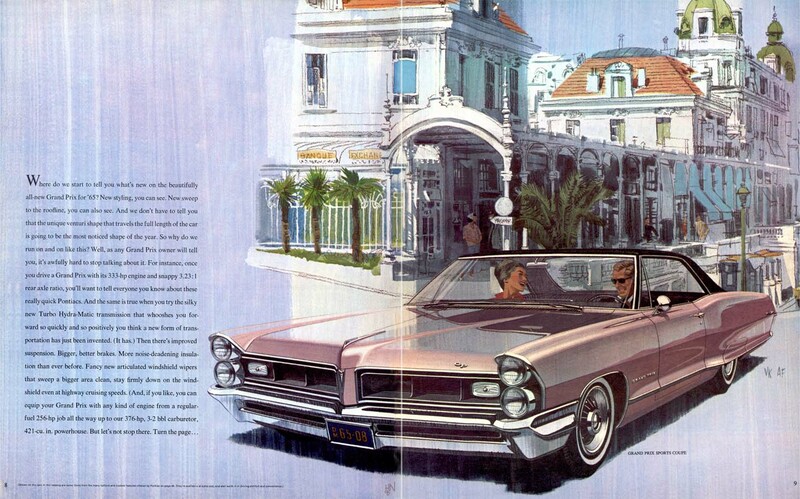 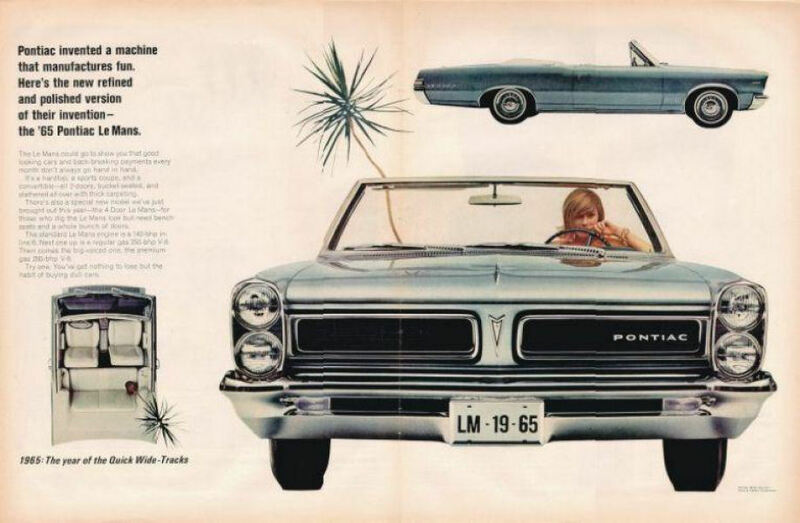 Pontiac prided itself on its vast array of options, and those for 1965 would continue the trend. 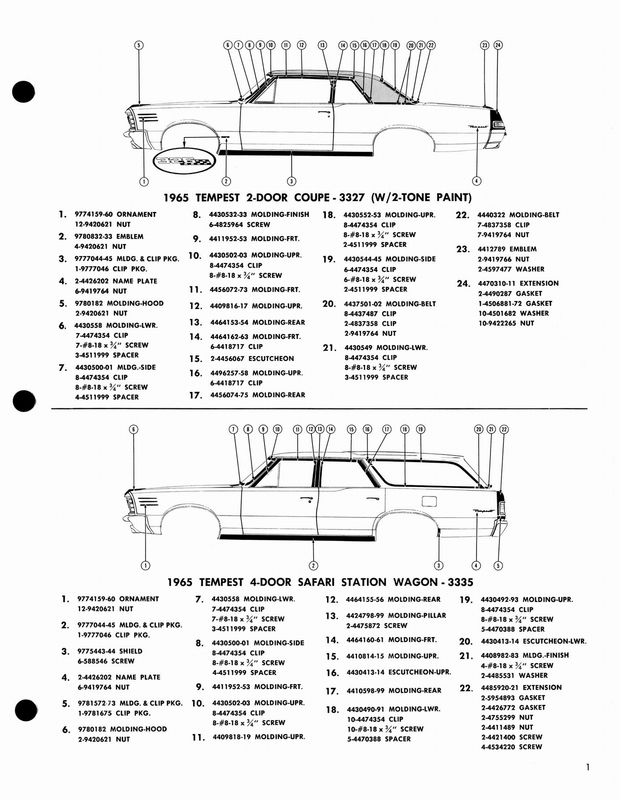 Of course there were the typical power assists for steering, brakes, windows, and seat, but there were quite a few more that merit mention. 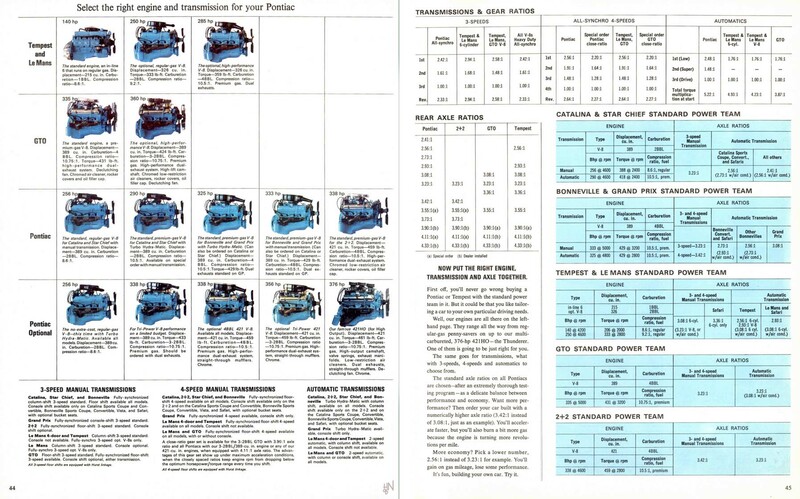 The extra-cost Tri-Power engine increased output (details below) and was an image builder. 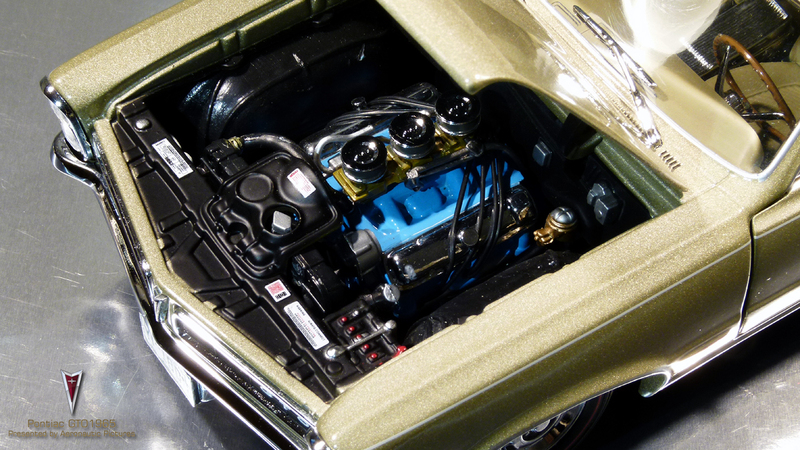 A Transistor Ignition System reduced maintenance and increased spark plug life and ignition output at higher speeds. 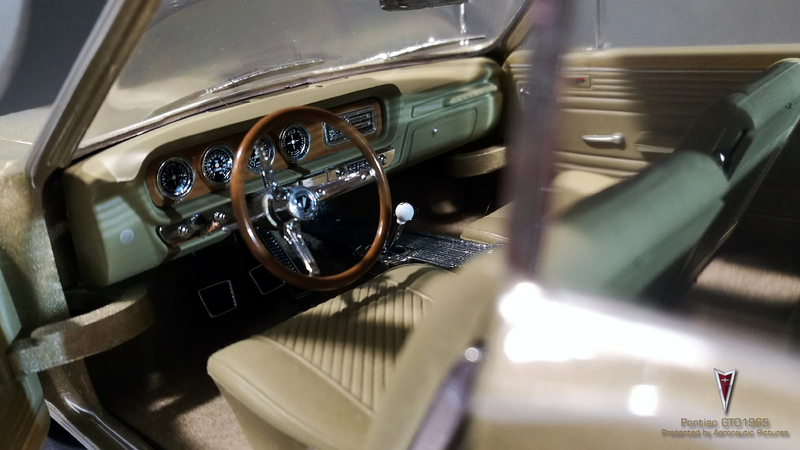 A new Rally gauge option replaced the standard dials with redesigned ones that featured a different 120-mph speedometer with a checkered fl ag on it, an 8,000-rpm tach, and gauges for oil pressure and coolant temperature with numerical readouts. 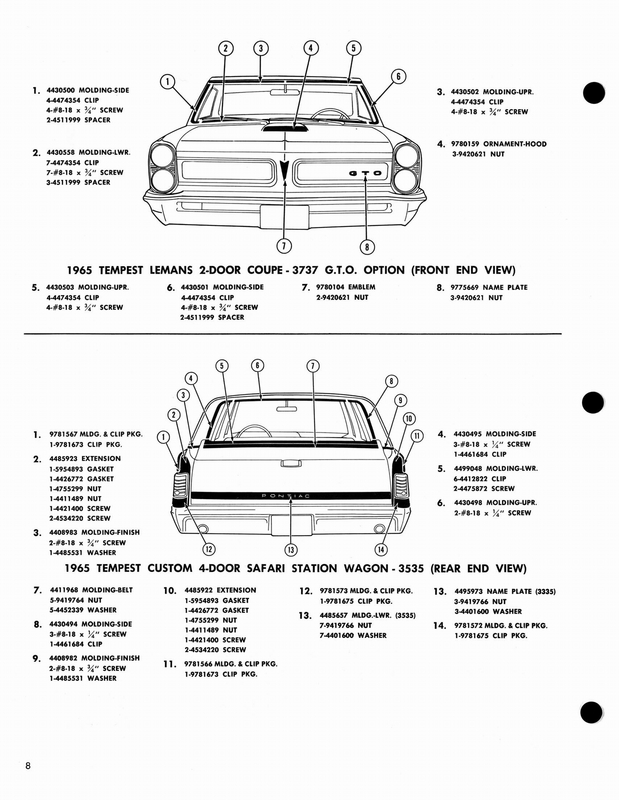 The fuel gauge and battery warning lamp were repositioned. 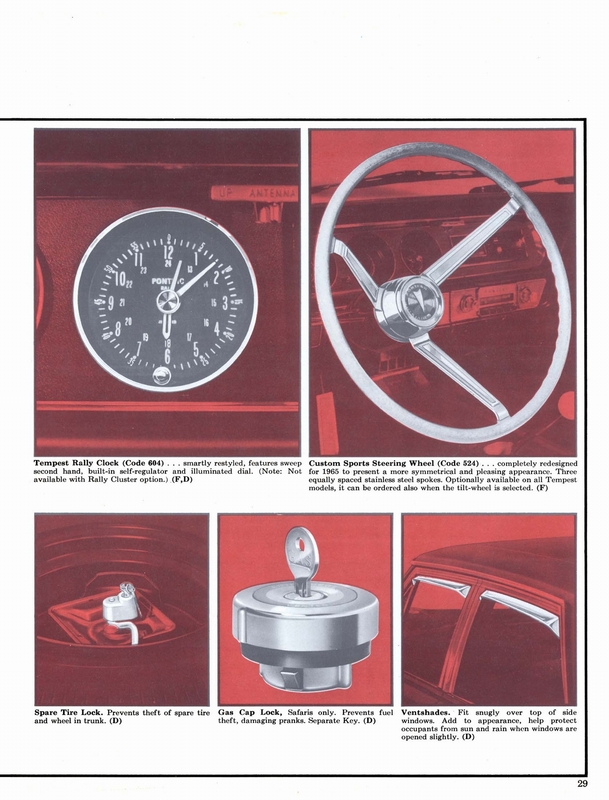 Two instrument options that couldn't be had with Rally Gauges were the Rally Clock and the Safeguard speedometer with low-fuel warning lamp. 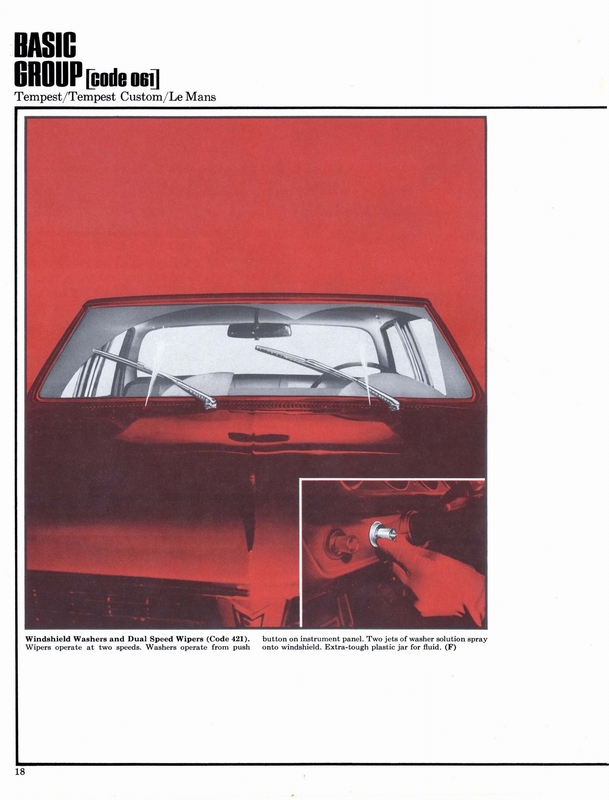 A control knob was used to set the speed, and a buzzer warned the driver when it was exceeded. 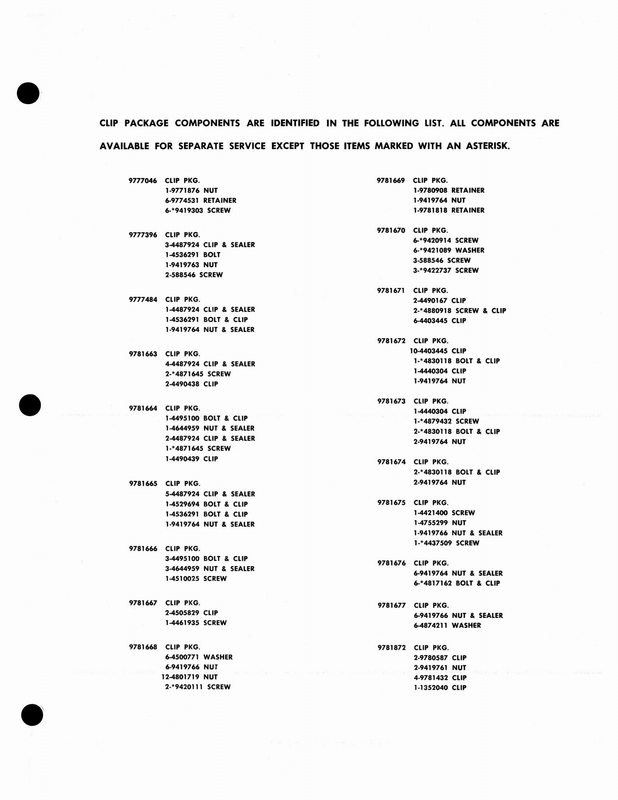 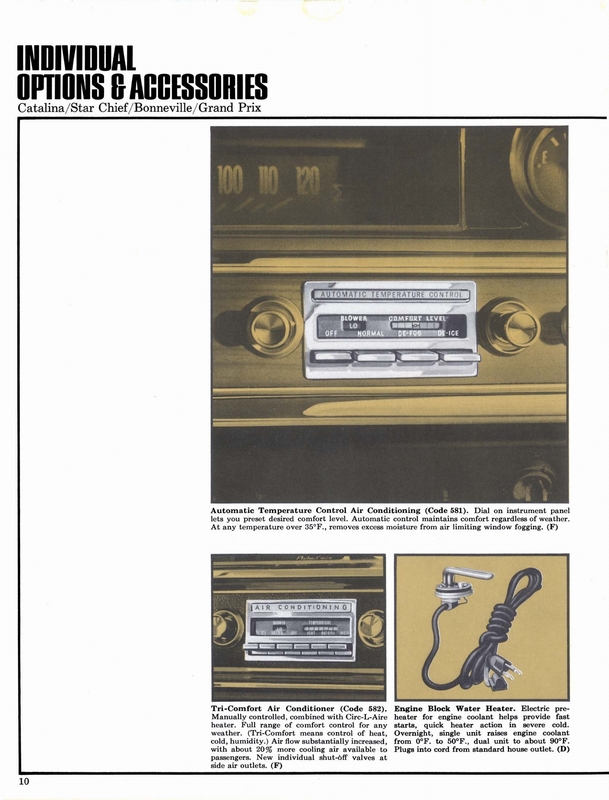 Two AM radios were offered, and an AM/FM radio was new for 1965. 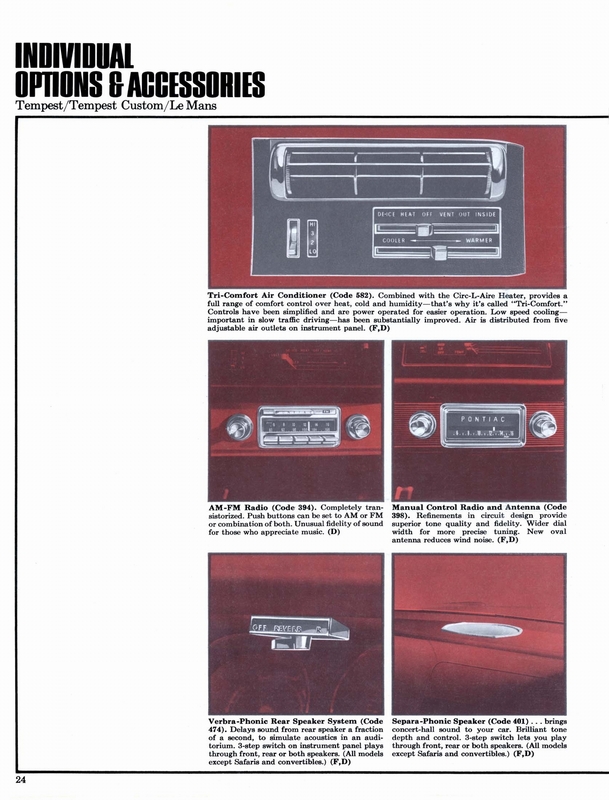 They could be had with a rear speaker, a Verbra-phonic unit (that emulated the echoes of an auditorium), and/or an electric antenna. 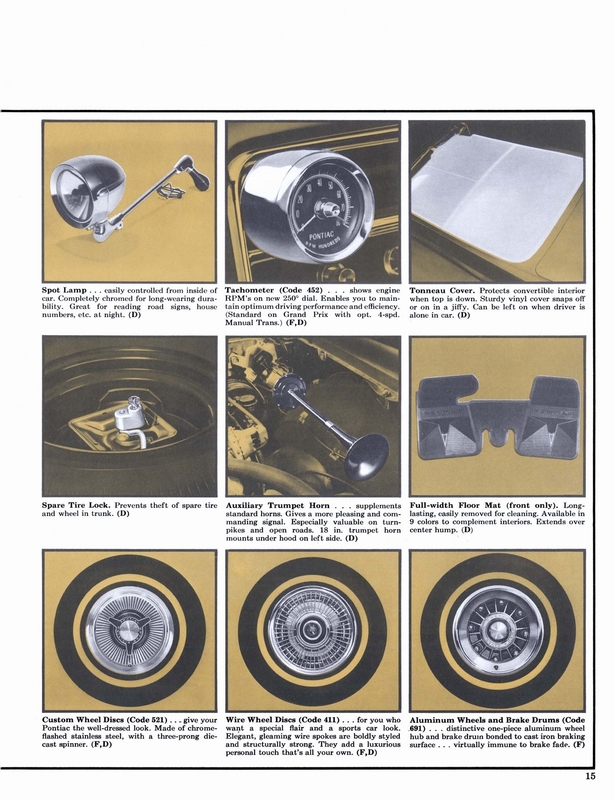 The extra-cost Custom Sports simulated-wood wheel featured three stainless-steel spokes instead of the four of the previous year and a new horn button. 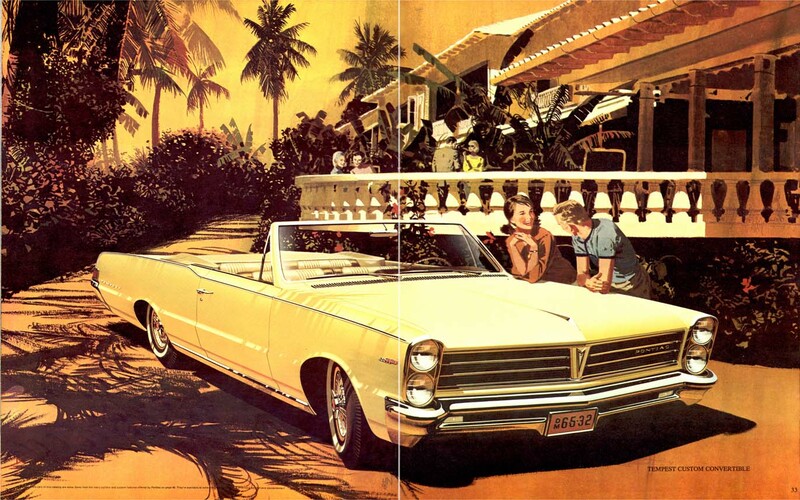 The HD frame option placed the stiffer boxed convertible frame under the sports coupe or hardtop, and a ride and handling package was offered. 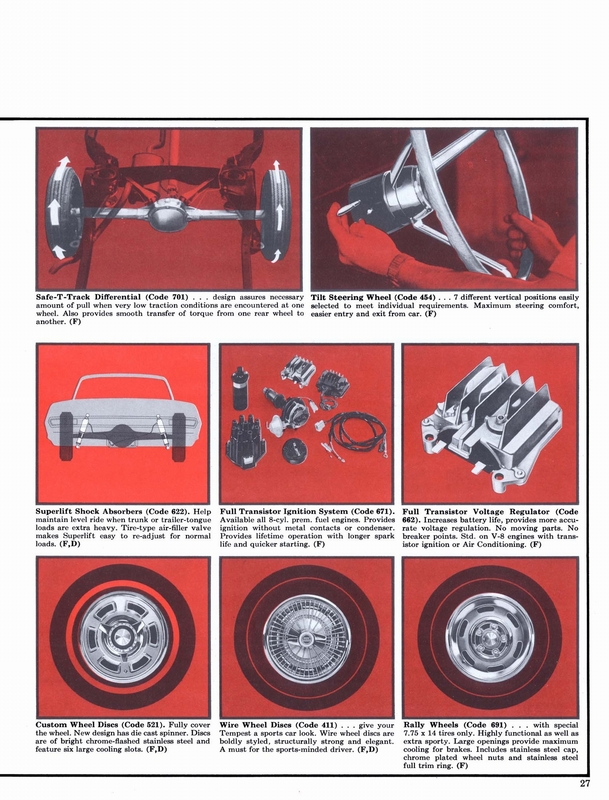 To reduce brake fade, aluminum front drums (with metallurgically bonded cast-alloy iron braking surfaces) that dissipated heat faster could be ordered, or metallic brake linings to use with the standard iron drums could be specified. 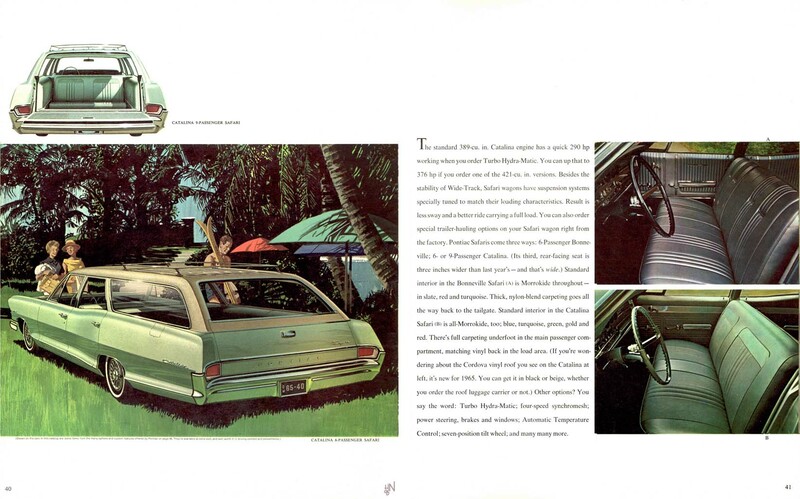 A tilt steering wheel and A/C increased driver comfort, and new Rally wheels with six cooling slots and decorative center caps, lug nuts, and trim rings added style, as did exhaust splitters. 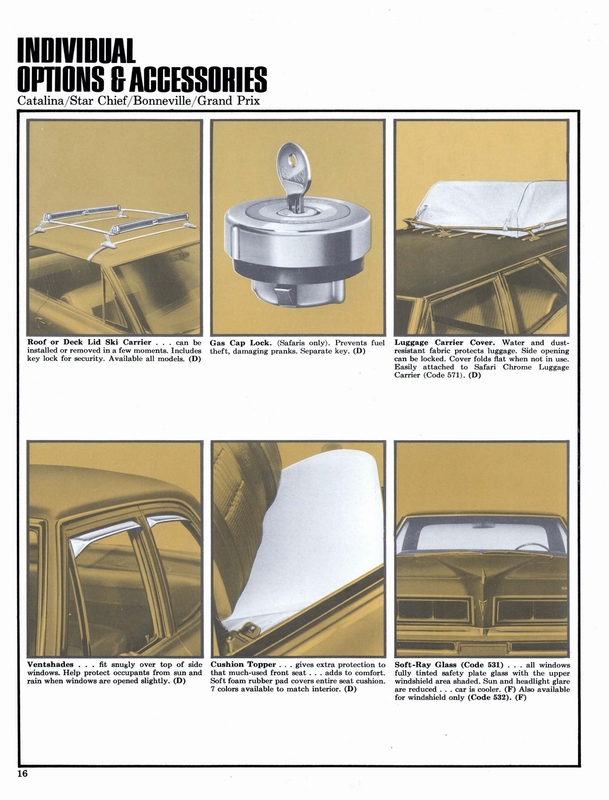 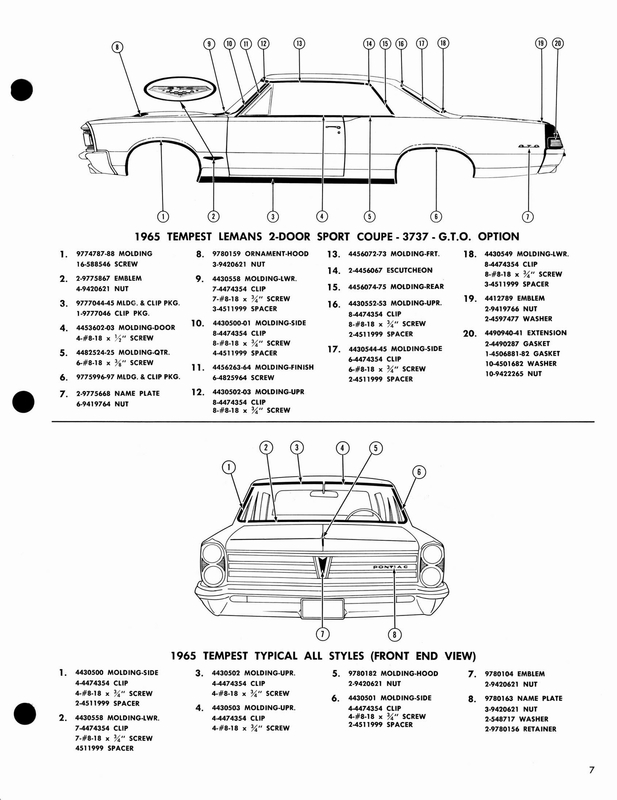 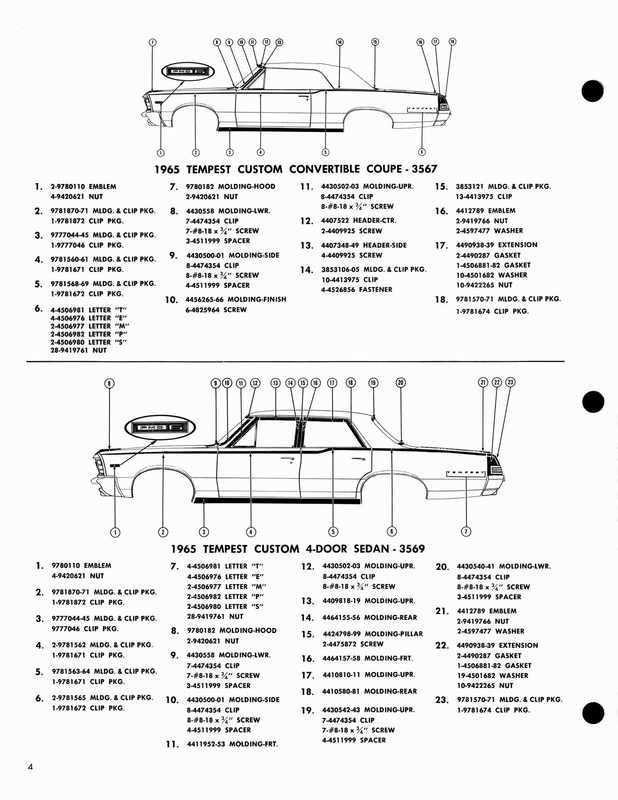 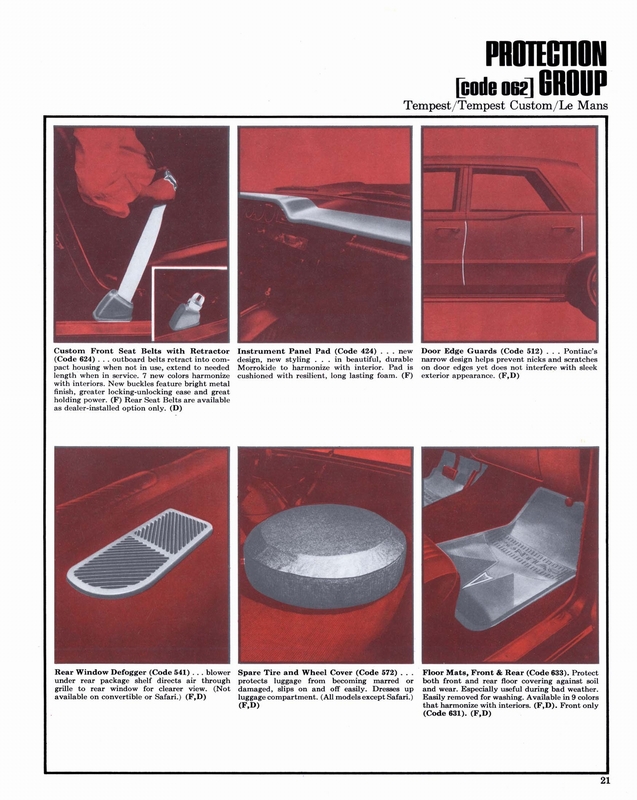 In August of 1965, an over-the-counter or dealer-installed Ram Air package became available that included a tub, which fit around the Tri-Power's carburetors, a foam rubber gasket to seal it to the hood, a hood-scoop ornament that could be made functional, and the other parts required to install the system. 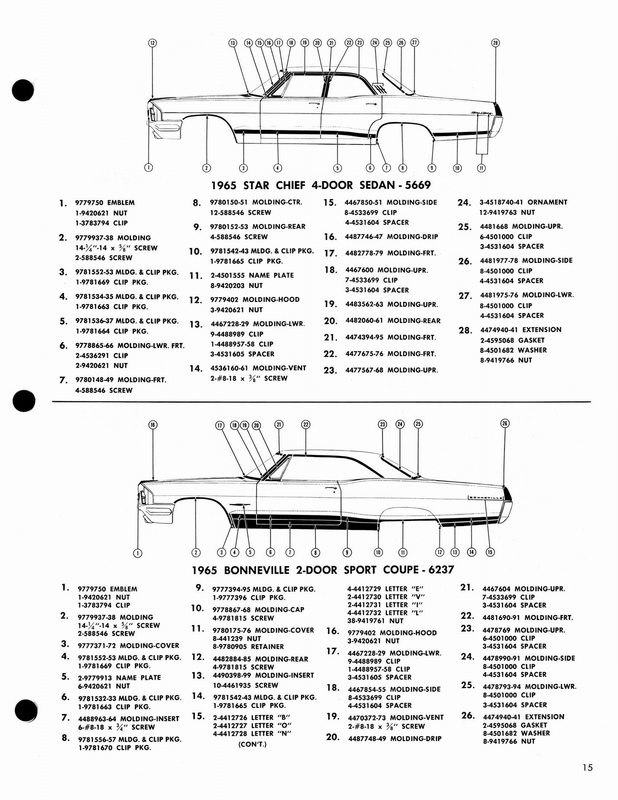 Like 1964, the 389 with a Carter AFB was standard, and the Tri-Power with three Rochester two-barrels was optional. 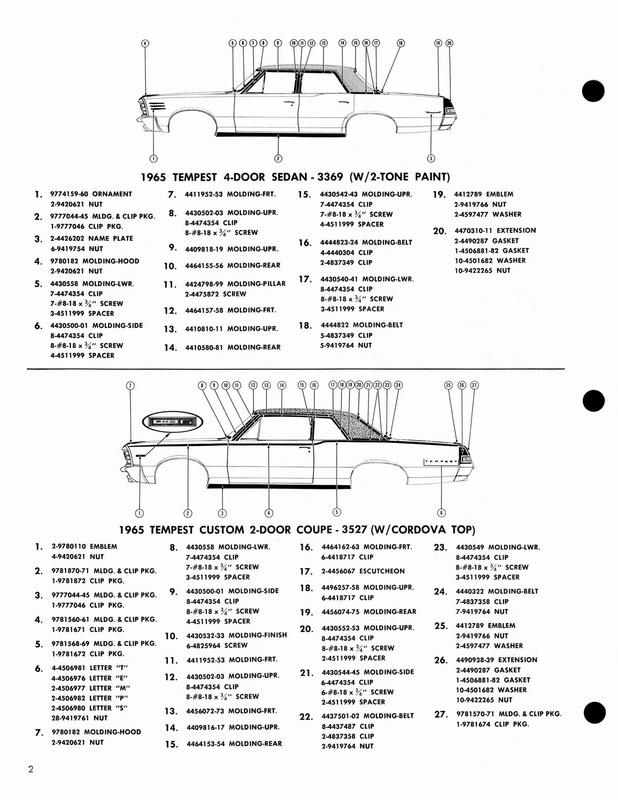 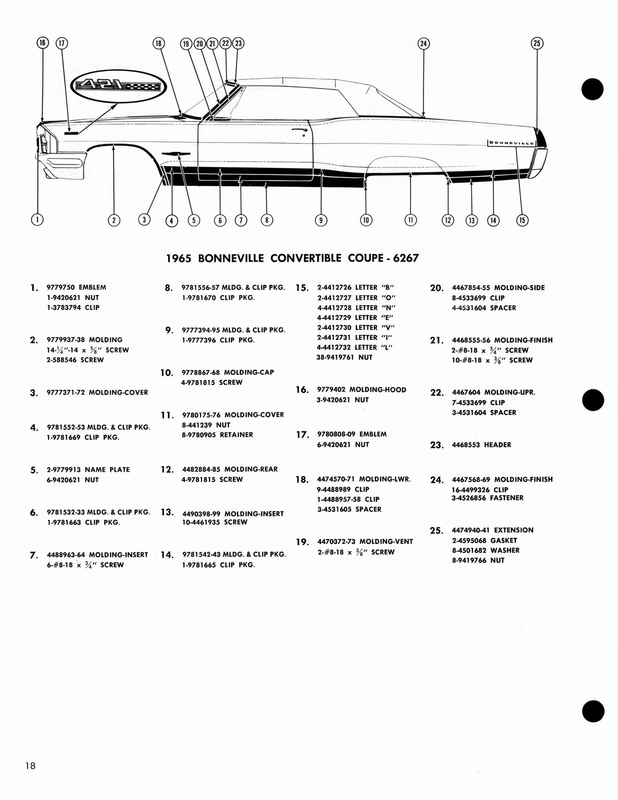 The intake manifold and cylinder heads (now #77) were revised for increased flow on both engines, but the Tri-Power's camshaft was upgraded to 288/302-degrees advertised duration, while the standard engine's cam remained at 273/289 degrees. 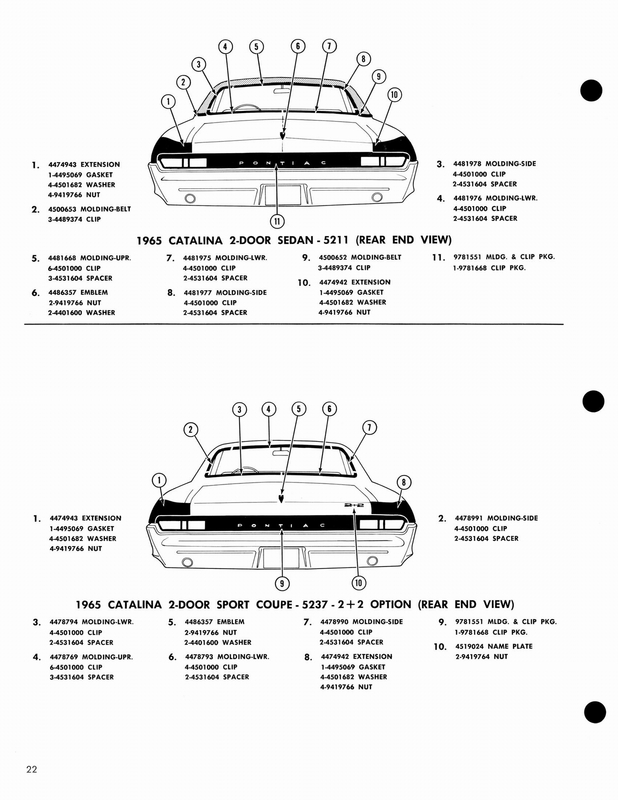 Power ratings increased to 335 hp and 360 hp, respectively. 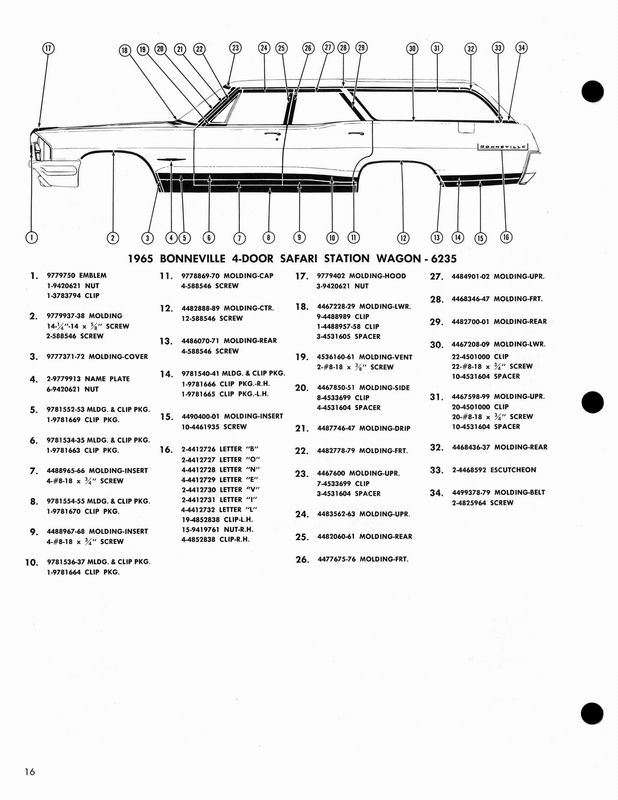 The 10.75:1 compression ratio, 1.92/1.66-inch valves sizes, and a two-bolt main block with a cast crank, rods, and pistons returned. 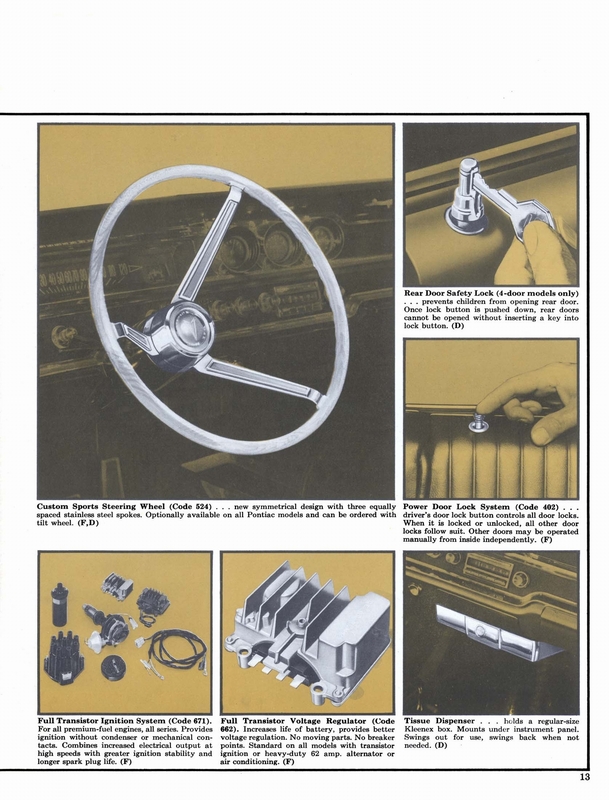 A floor-shifted Muncie three-speed manual, synchronized in second and third gears, was standard, and the fully-synchronized HD "Dearborn" three-speed was introduced in March, 1965. 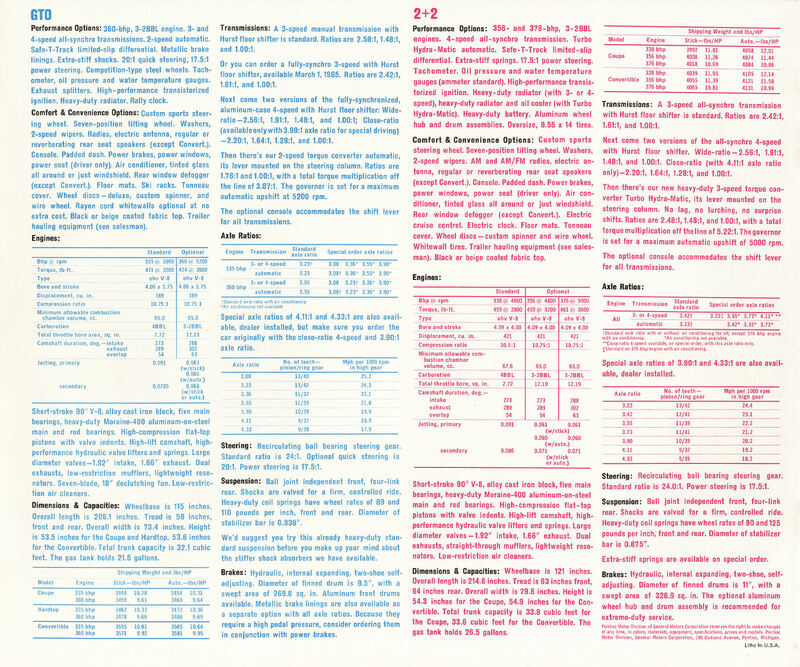 Wide-ratio Muncie M-20 and close-ratio M-21 four-speeds were extra cost. 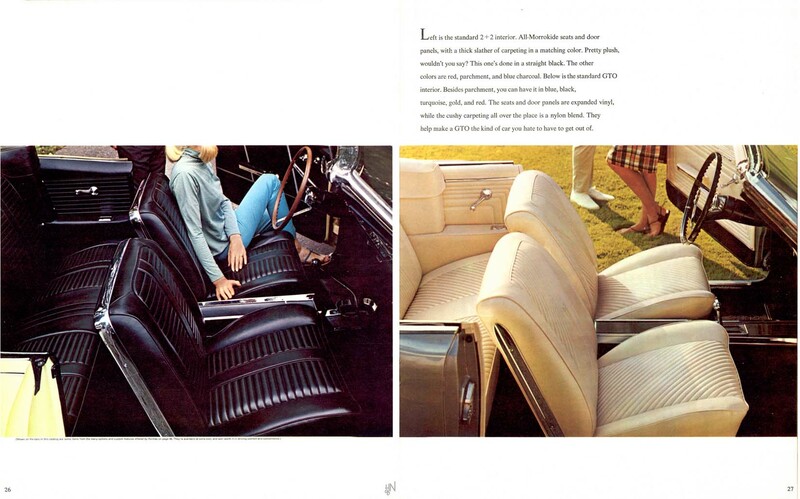 A Hurst shifter and a 10.4-inch clutch were used with manual transmissions. 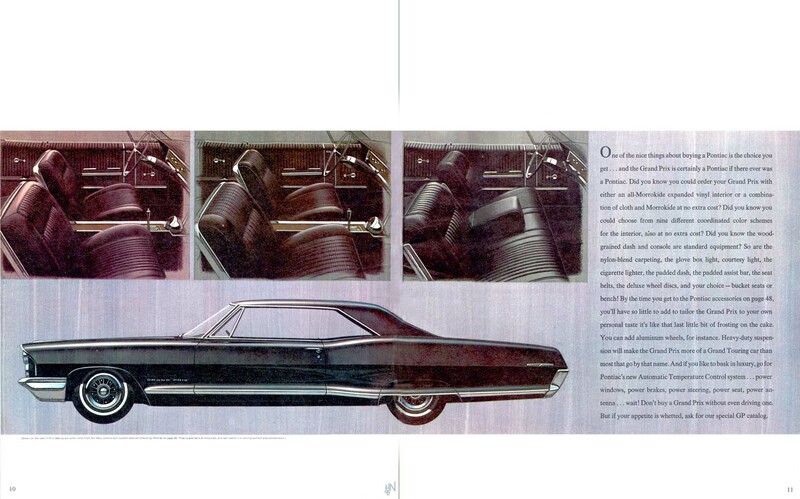 The Super Turbine 300 two-speed automatic was also optional, and was column shifted unless the console was ordered. 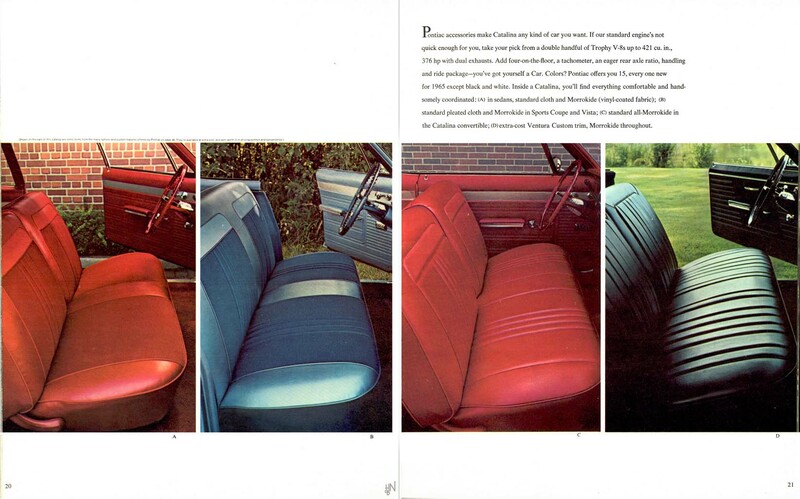 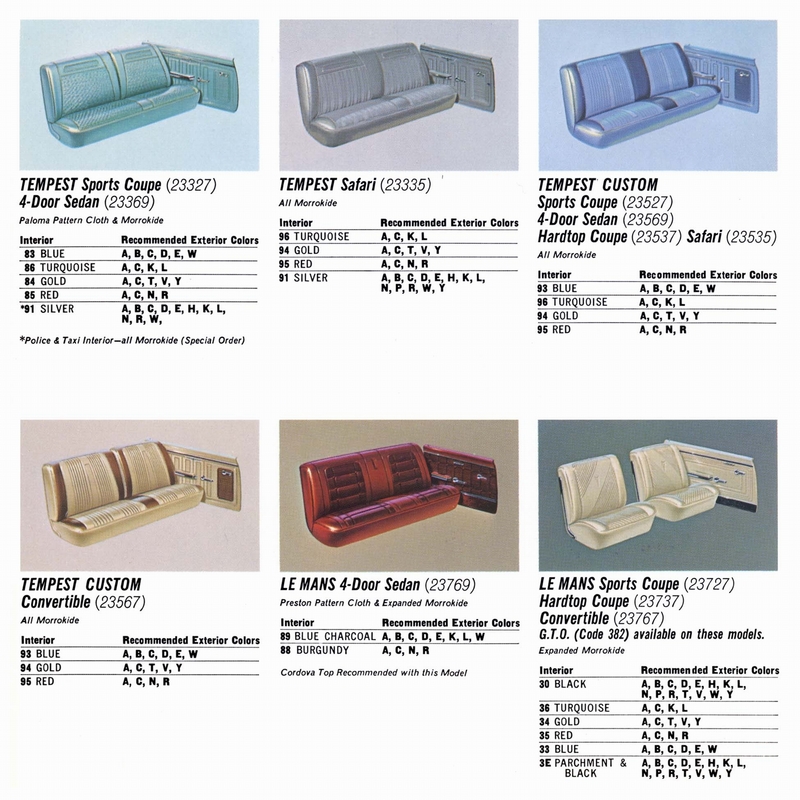 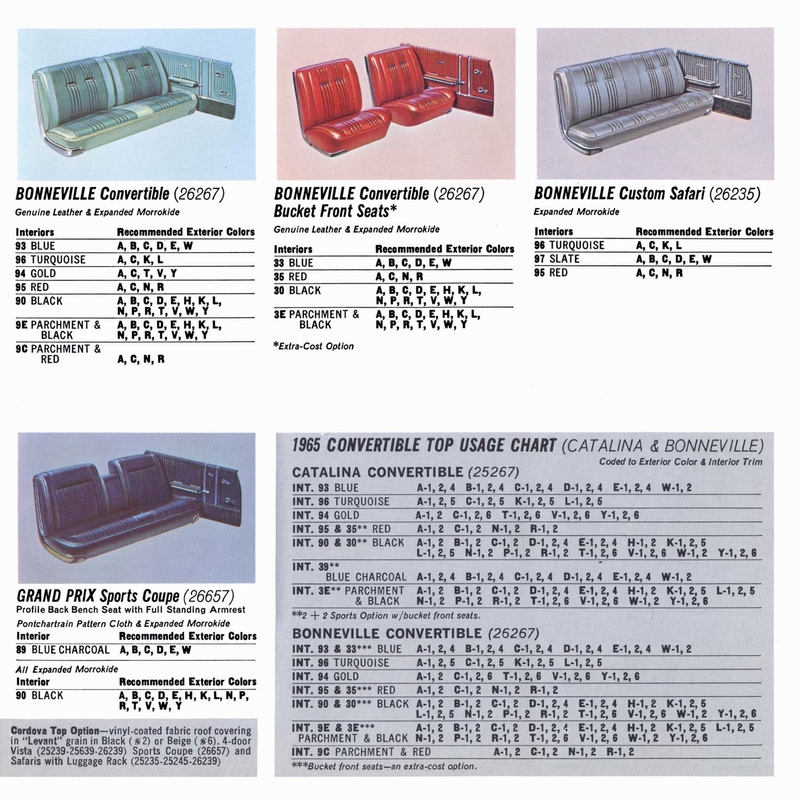 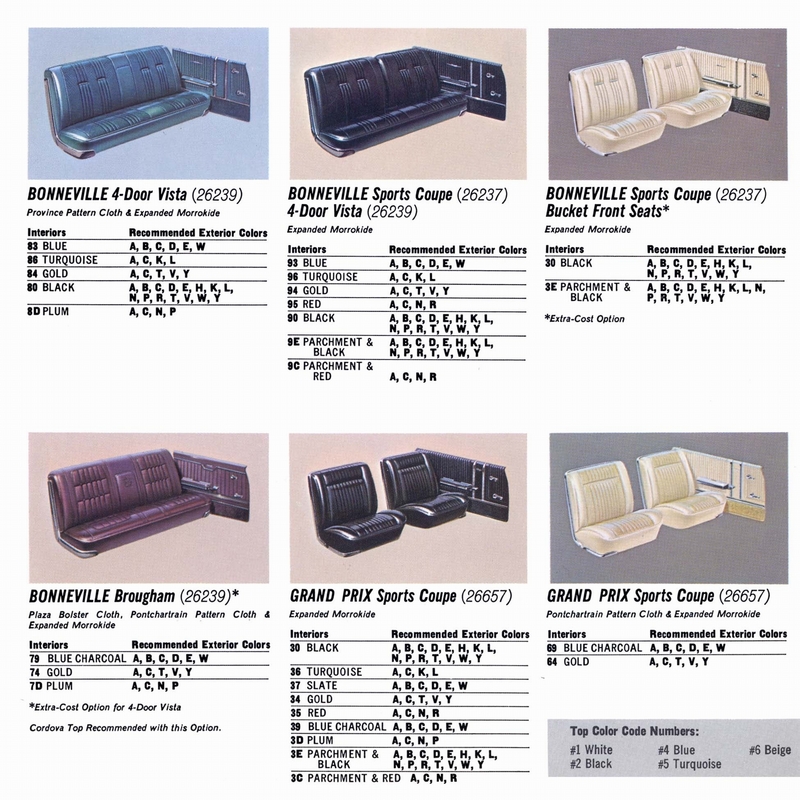 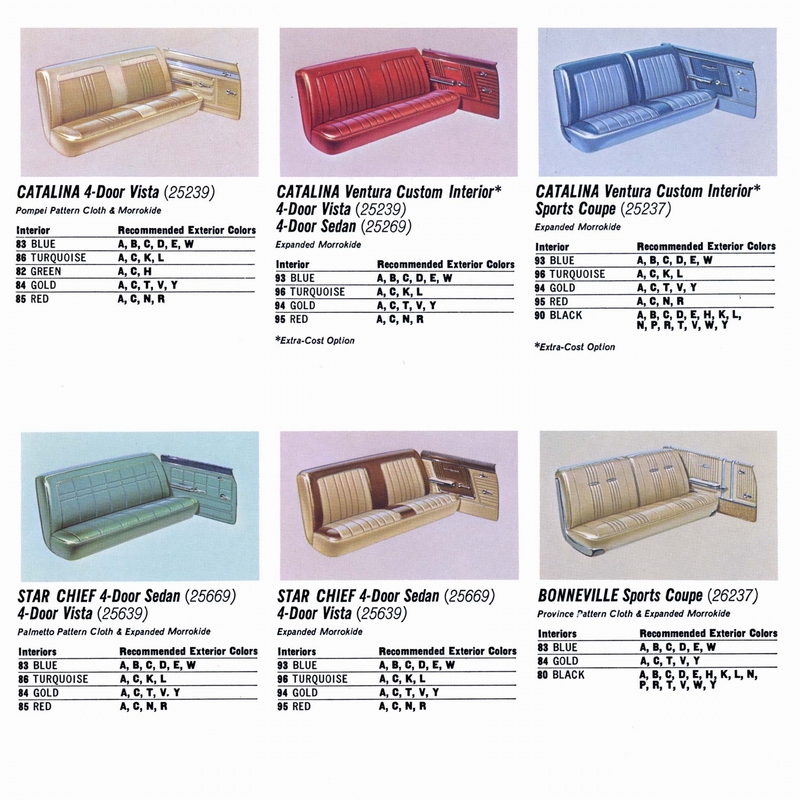 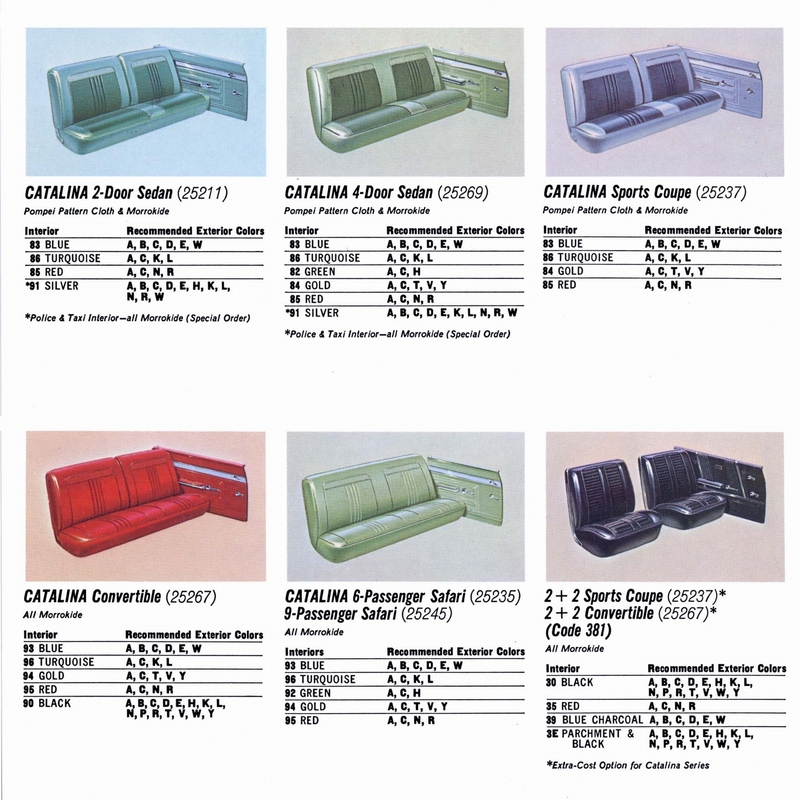 The Expanded Morrokide upholstery had a new diagonal pattern and Pontiac arrowheads on the seats, and the door panels were revised. 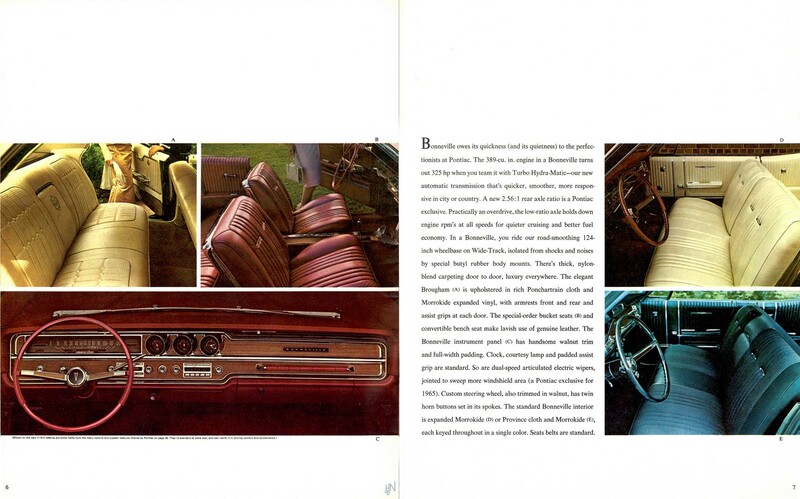 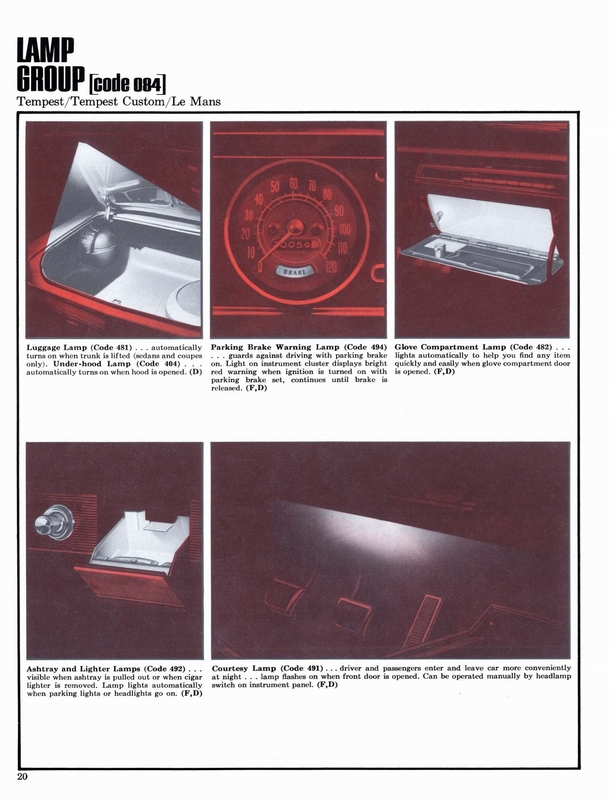 Though the instrument panel was mostly carried over, the engine-turned applique of 1964 became a wood veneer or vinyl woodgrain one (both were used) for 1965. 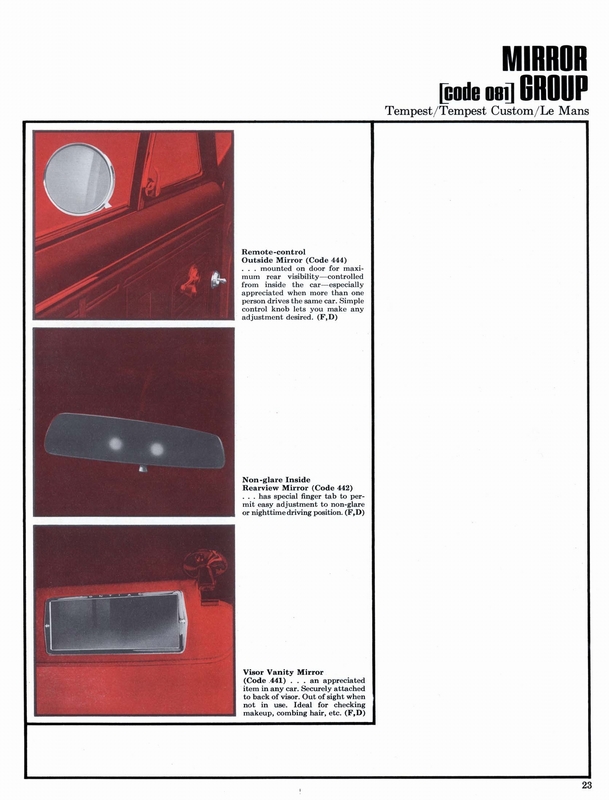 In three of the four pods (the right one had a blank plate) were a 120-mph speedometer, a fuel gauge, and warning lamps for battery, temperature, and oil pressure. 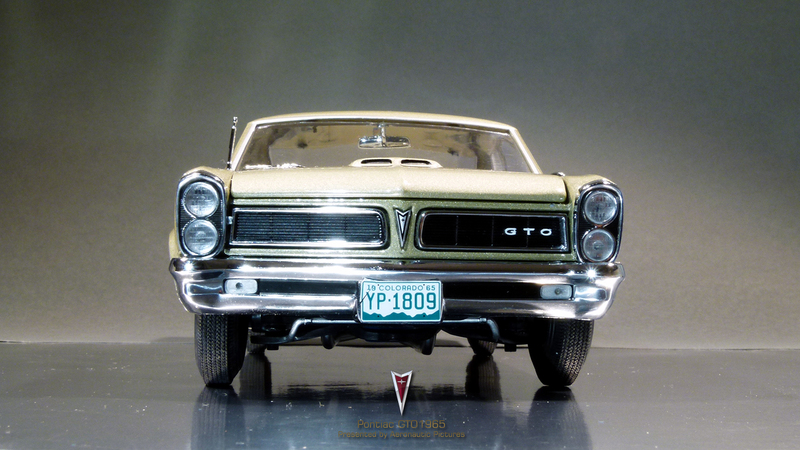 On the dash, a passenger assist bar, with "GTO" lettering on its base, replaced the GTO crest of1964. 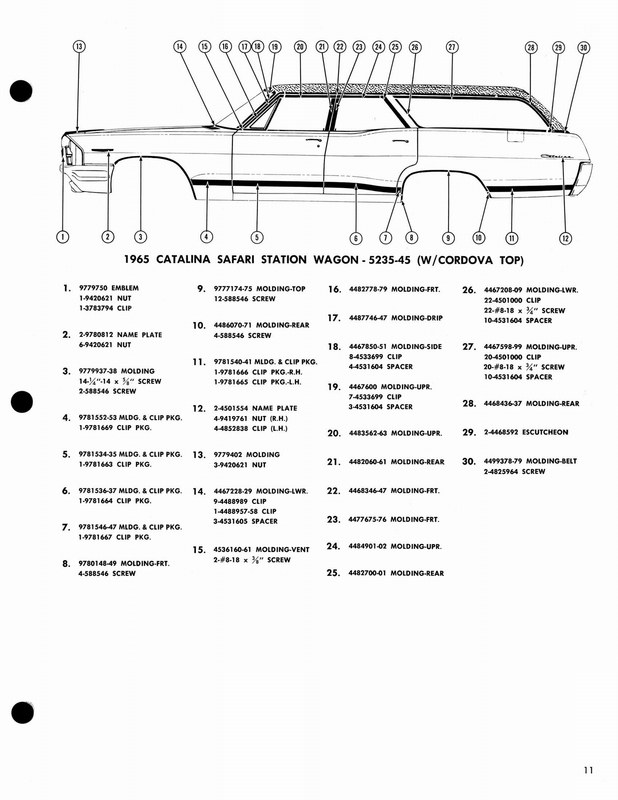 The 115-inch-wheelbase perimeter frame returned, but now with a welded instead of riveted rear cross member. 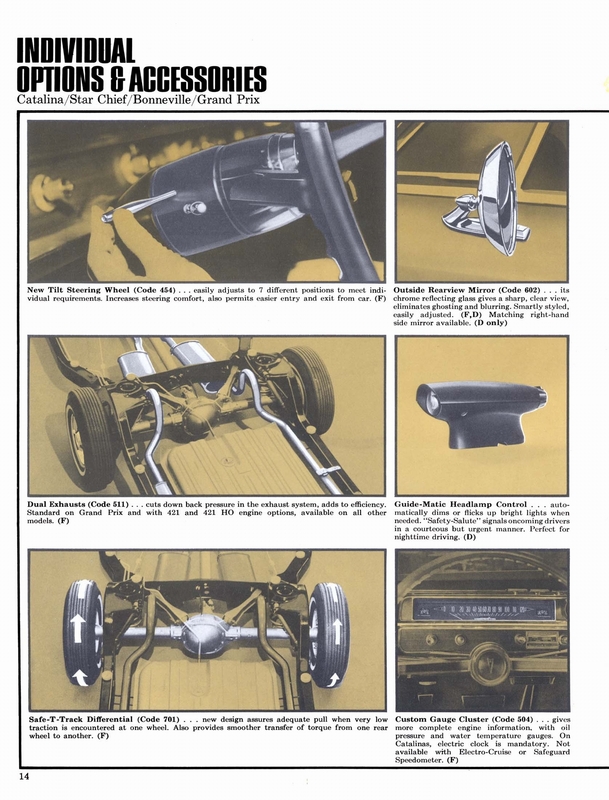 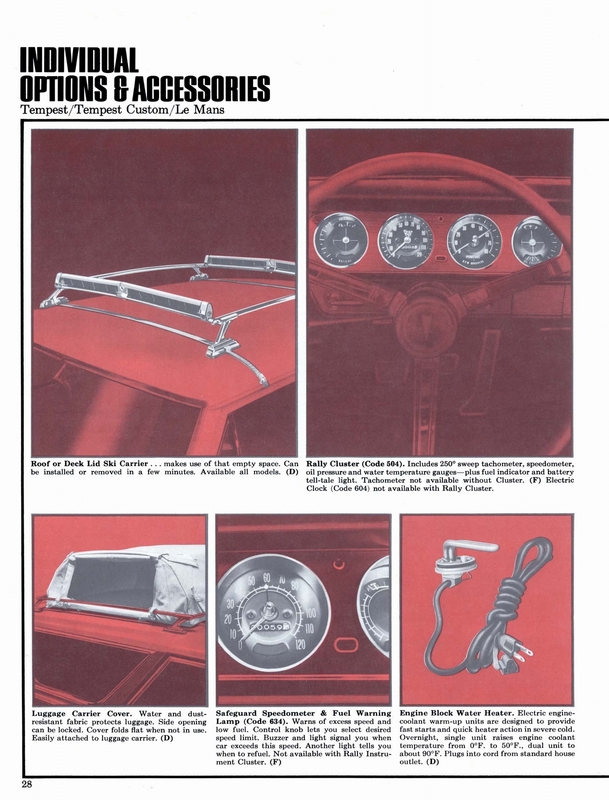 The .938-inch front sway bar, SLA front suspension, four-link rear setup, and HD coil springs and shocks were retained. 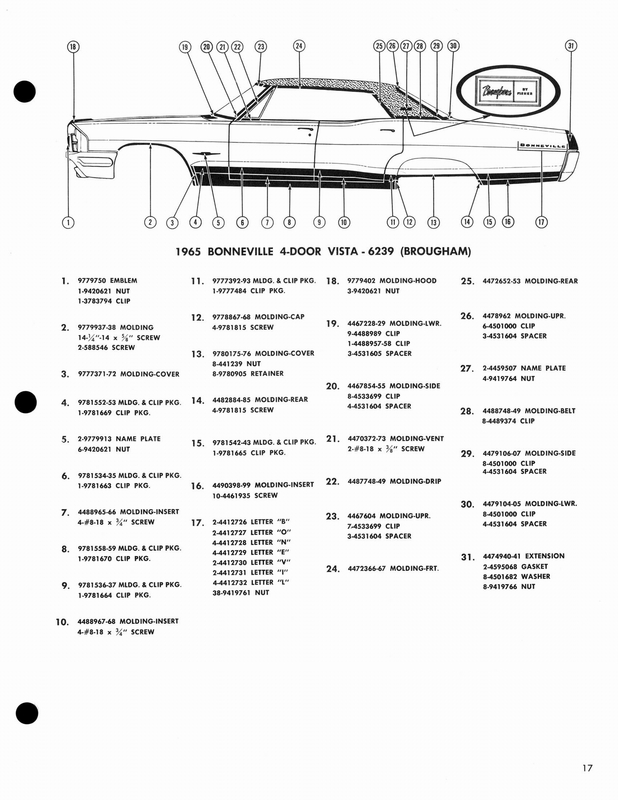 Five turns-to-lock were required with the 24:1 manual steering gear, but optional power assist lightened the effort, cut the ratio to 17.5:1, and turns-to-lock to 4.2. 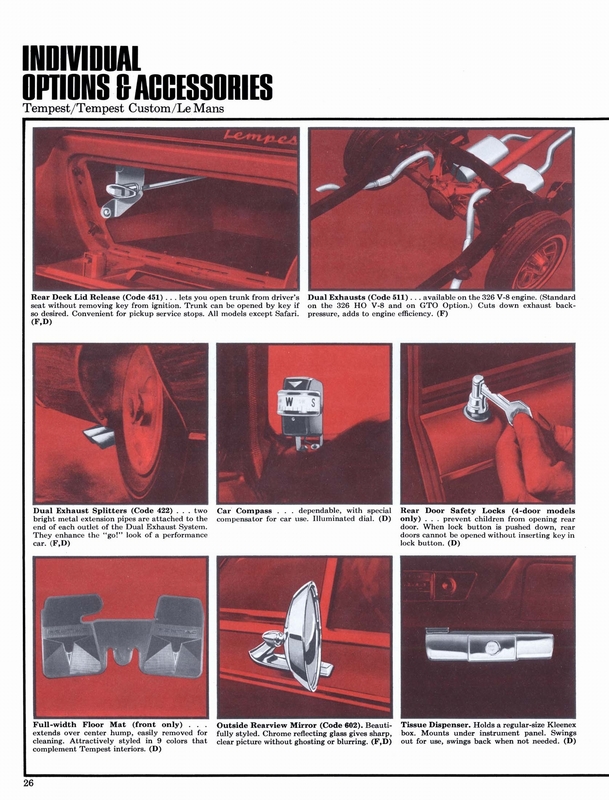 There was also a 20:1 quick-ratio manual steering option. 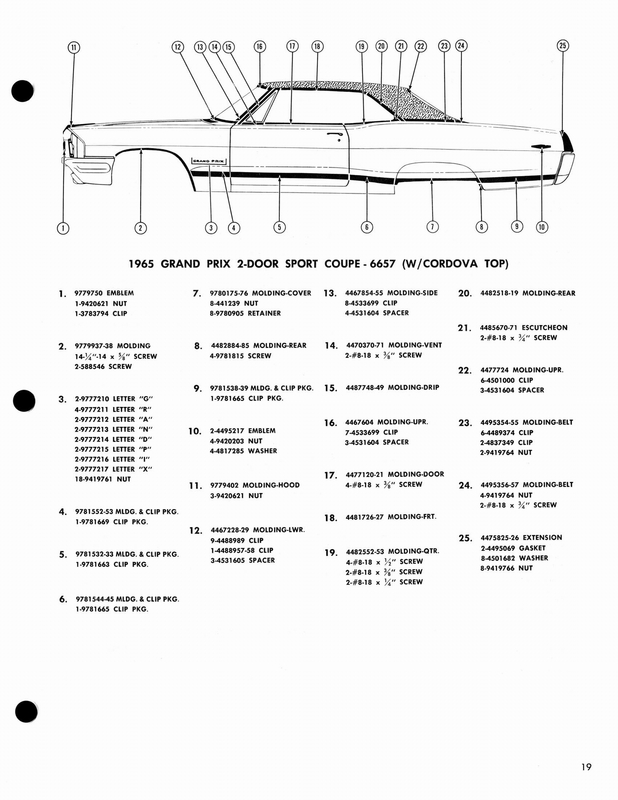 A set of 7.75 x 14 redline tires on 14 x 6 steel wheels was standard. 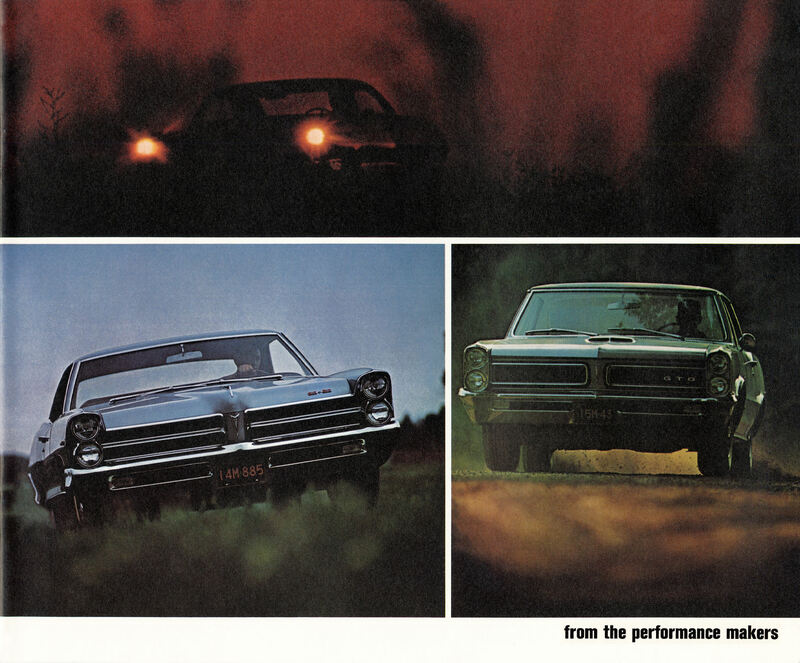 Pontiac adopted a more chiseled version of the full-size model's vertically stacked quad headlamp front end styling to the carried-over A-body shape. 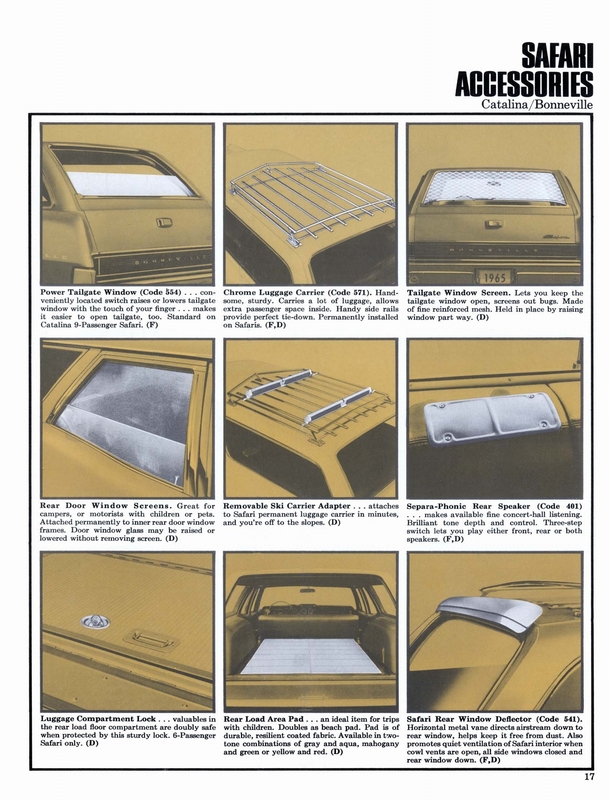 Recessed grilles were also new, as was the hood with a centrally located scoop that better lent itself to a Ram-Air setup. 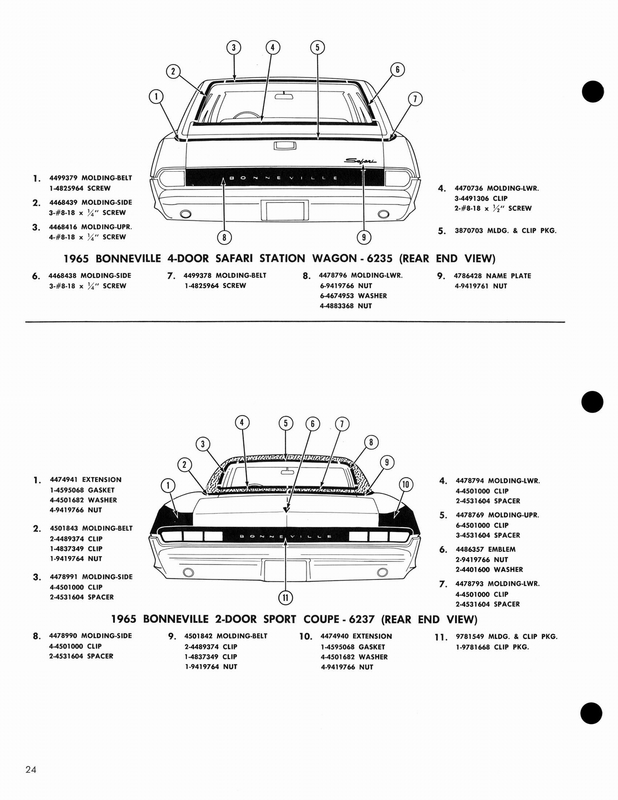 The rear was revised with a restyled chrome-ribbed center panel and wraparound tail lamps that nearly disappeared behind extensions of those ribs. 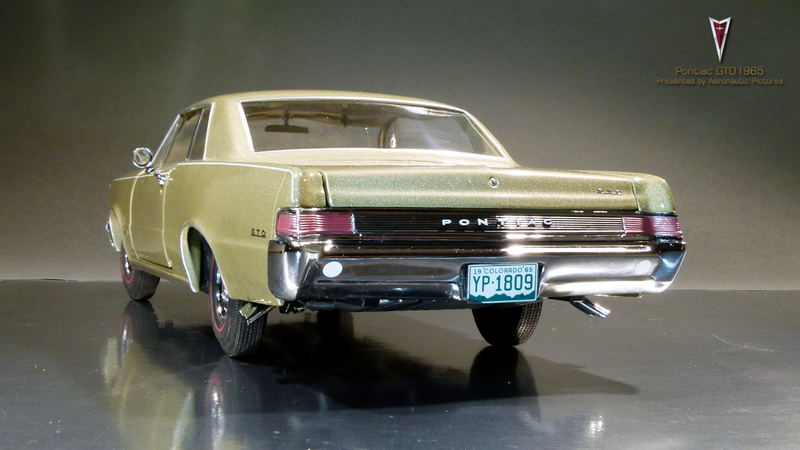 Behind the license plate was the relocated fuel filler. 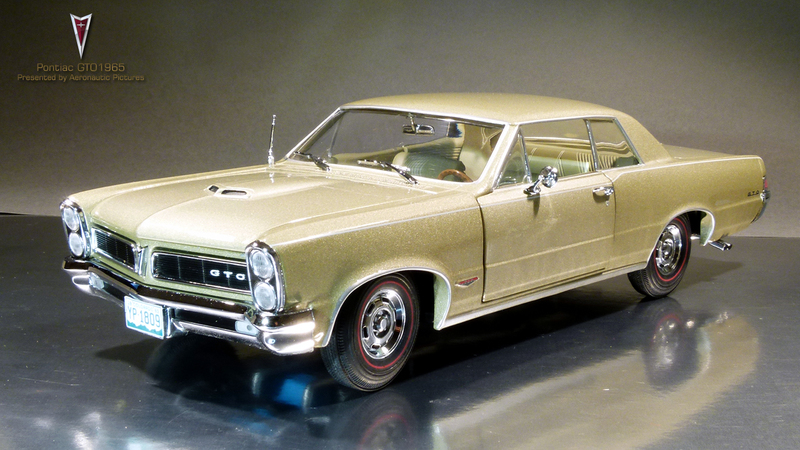 The new GTO was just over three-inches longer than it was the previous year. 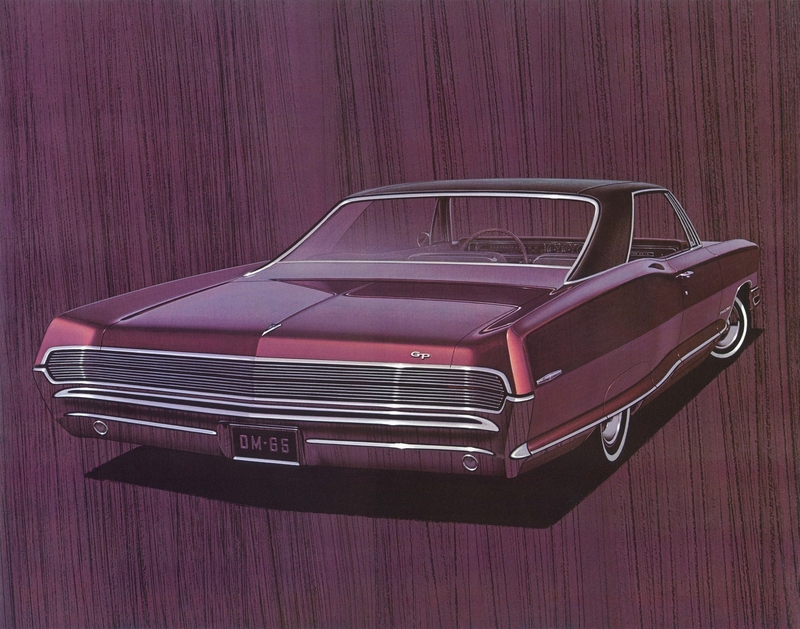 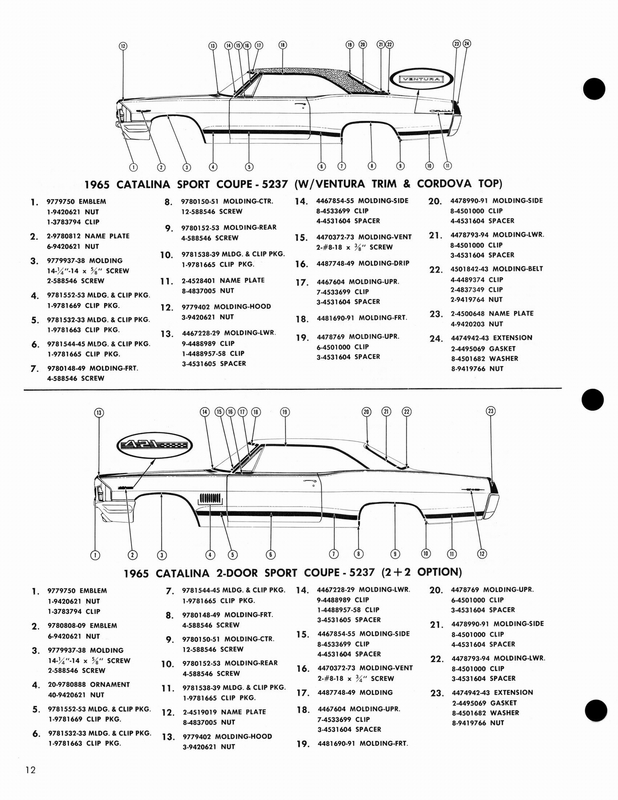 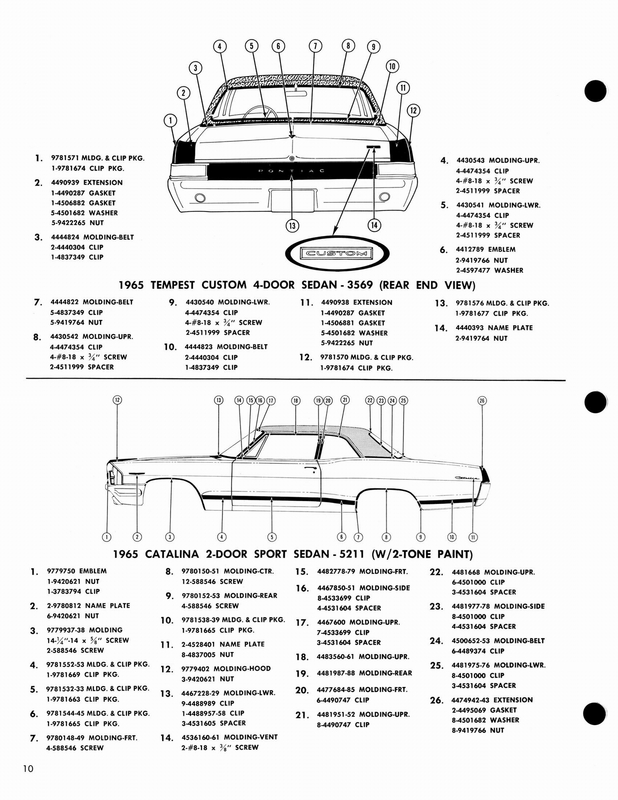 The hardtop was the most popular body style for 1965, with 55,722 built. 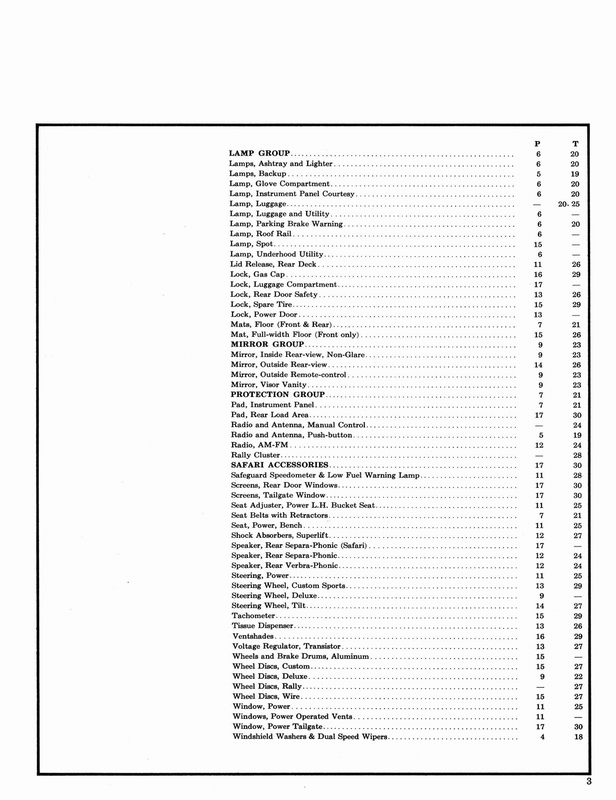 Convertibles were the highest priced, yet 11,311 were sold compared to 8,319 sports coupes--the least expensive body style. 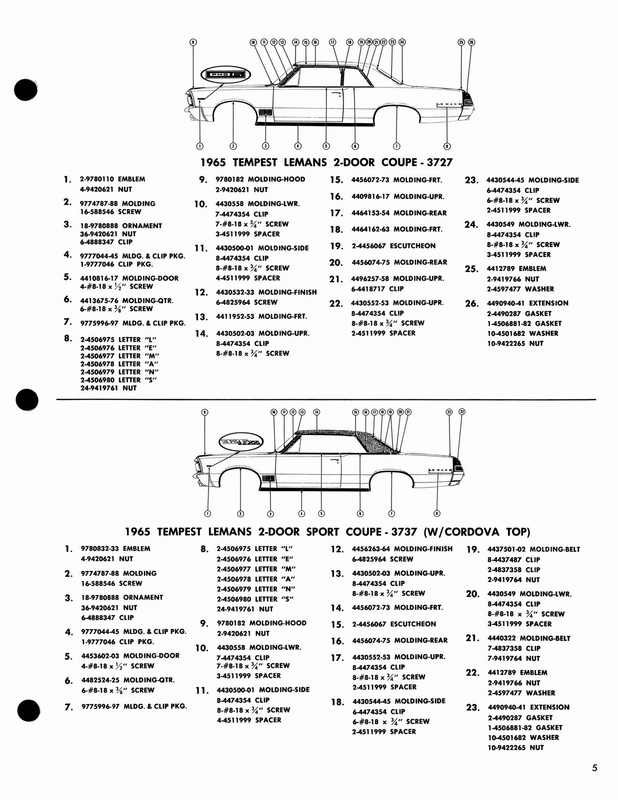 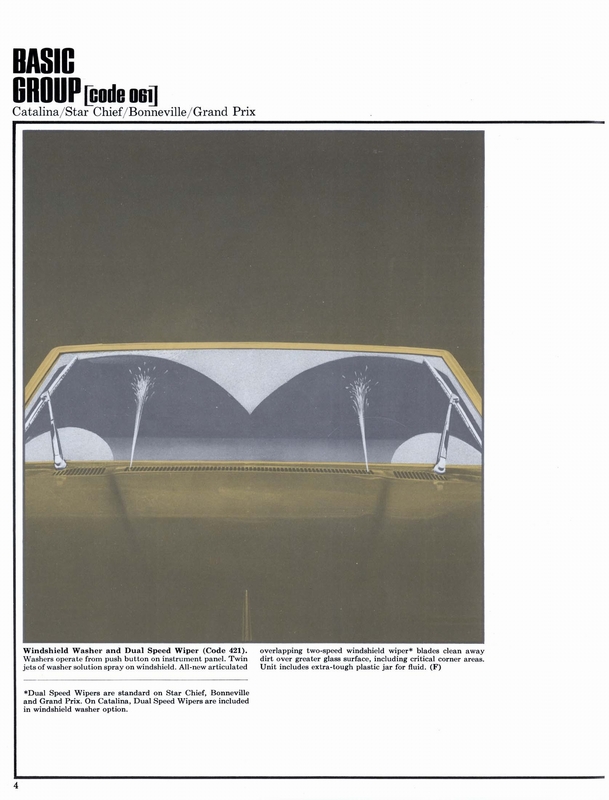 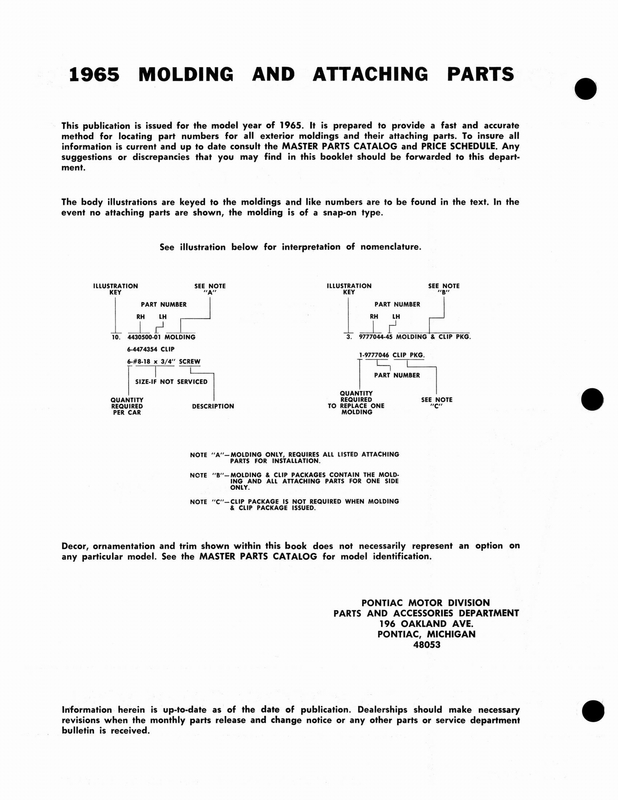 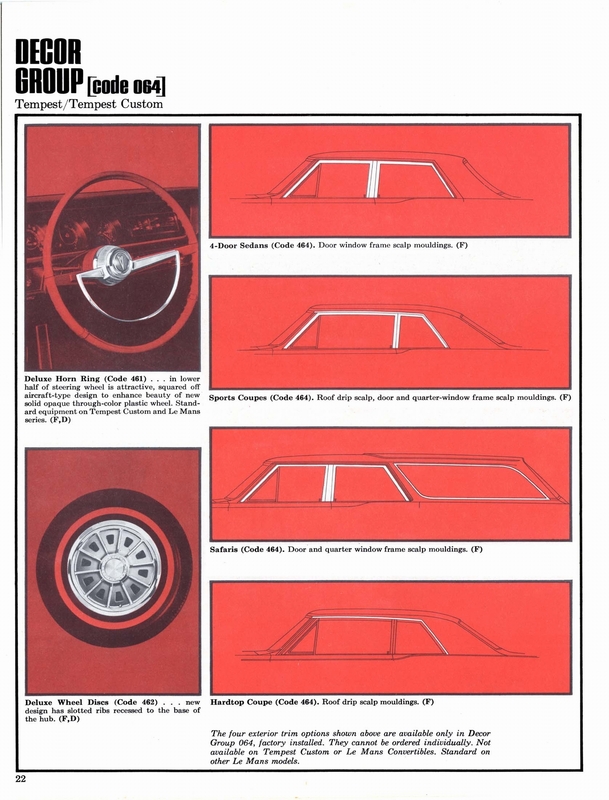 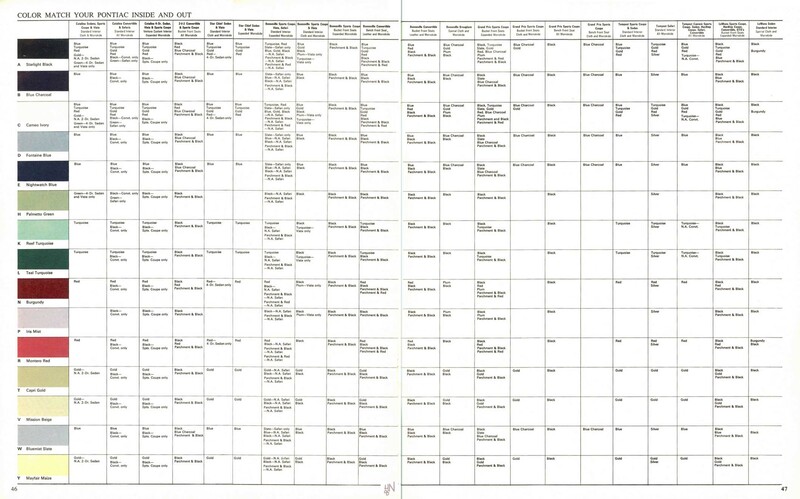 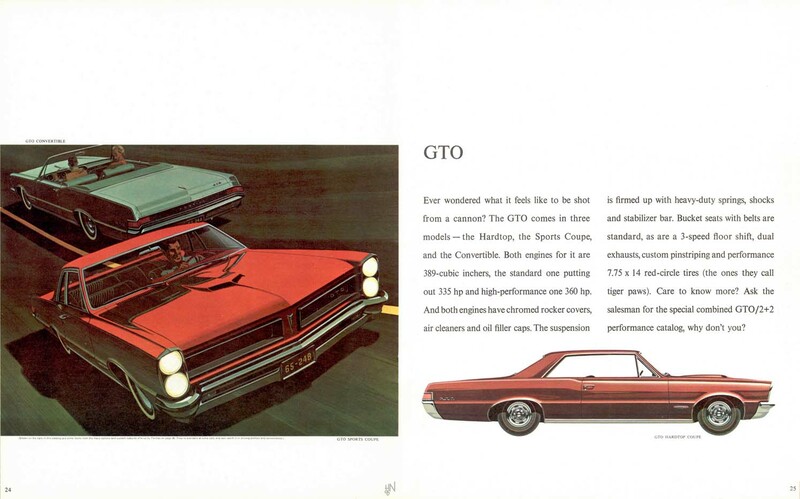 Tri-Power GTOs accounted for 20,547 of total production, and the four-barrel GTOs, 54,805. 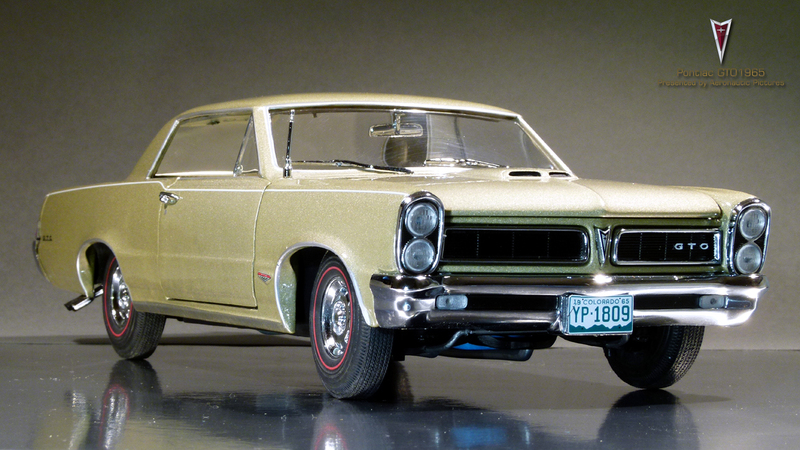 Top of the line examples are sold today for over $150,000 USD.